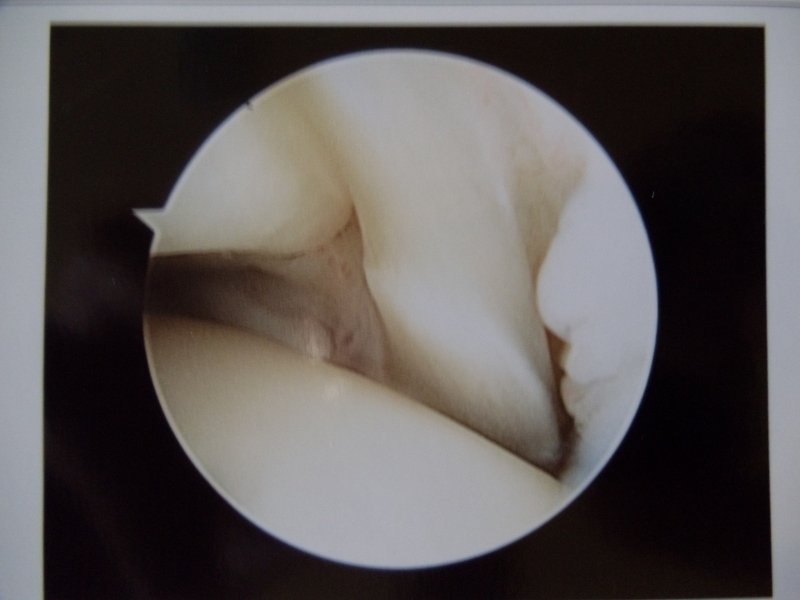 Foot and ankle injuries are very common in sports or in general activities of daily living. 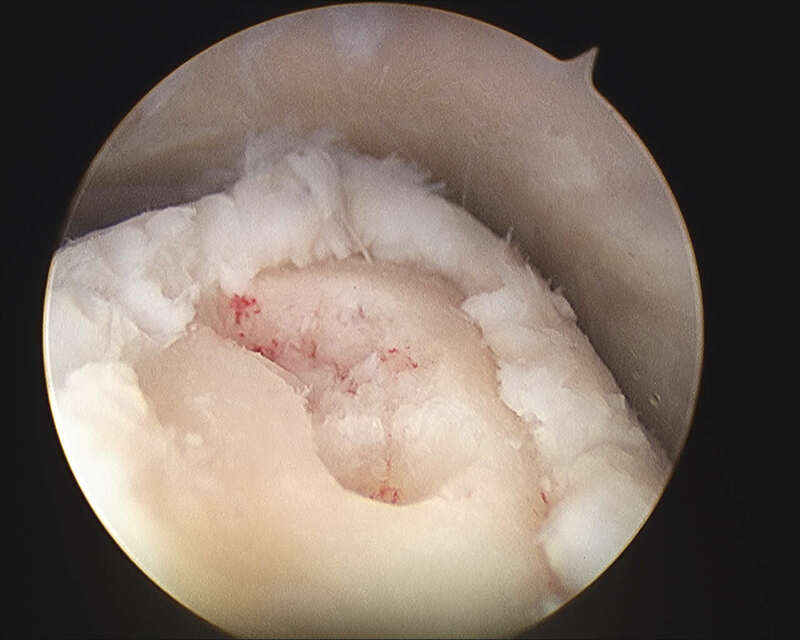 Many structures including bone, ligament, cartilage and joint lining may be injured. 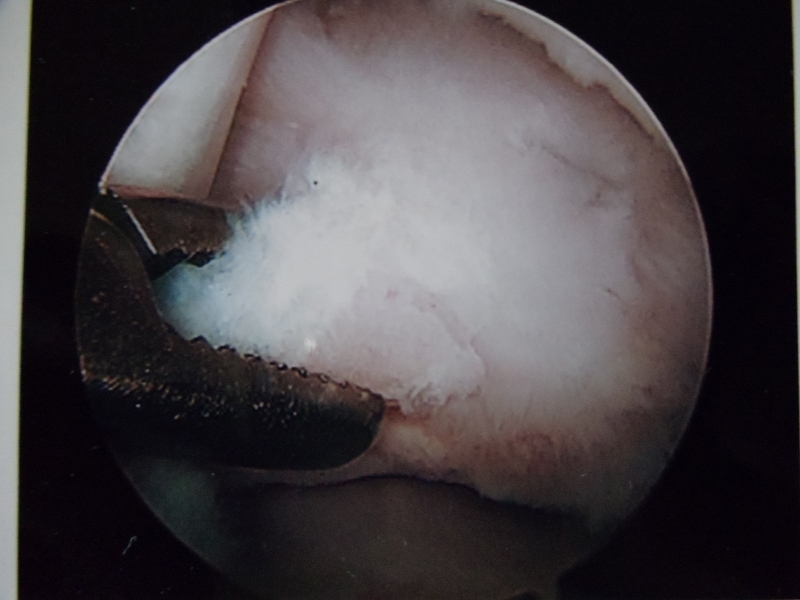 Injuries may occur from a single traumatic event or from overuse. 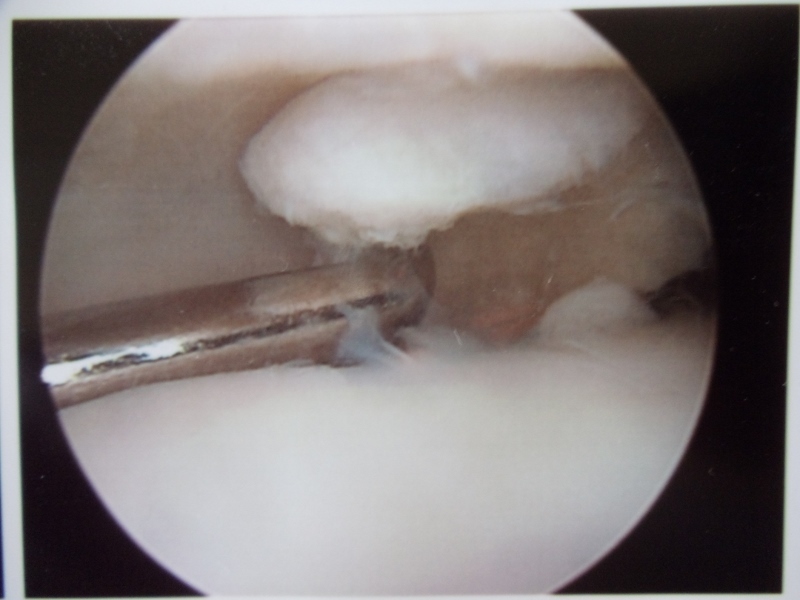 Injuries may occur during the teenage years that may manifest themselves later on. 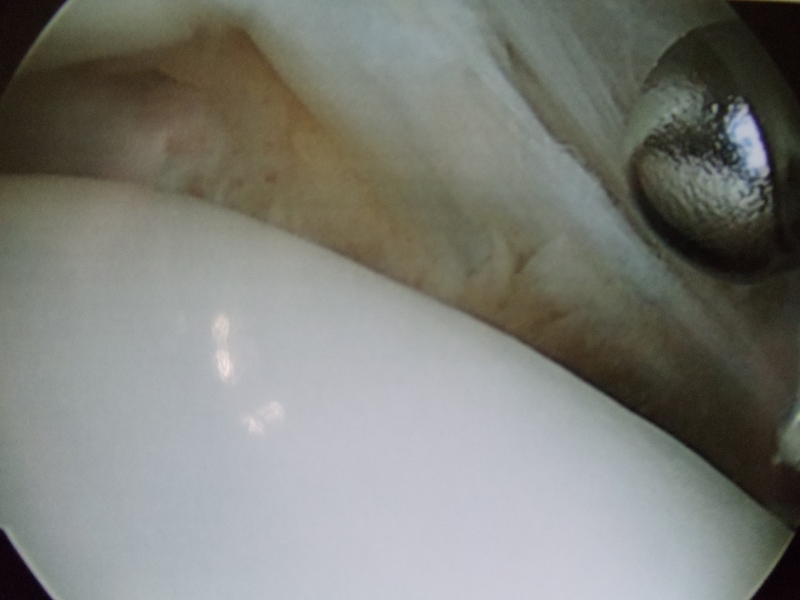 These injuries may cause stiffness and pain in the foot or the ankle joints, especially after getting out of bed first thing in the morning to walk. 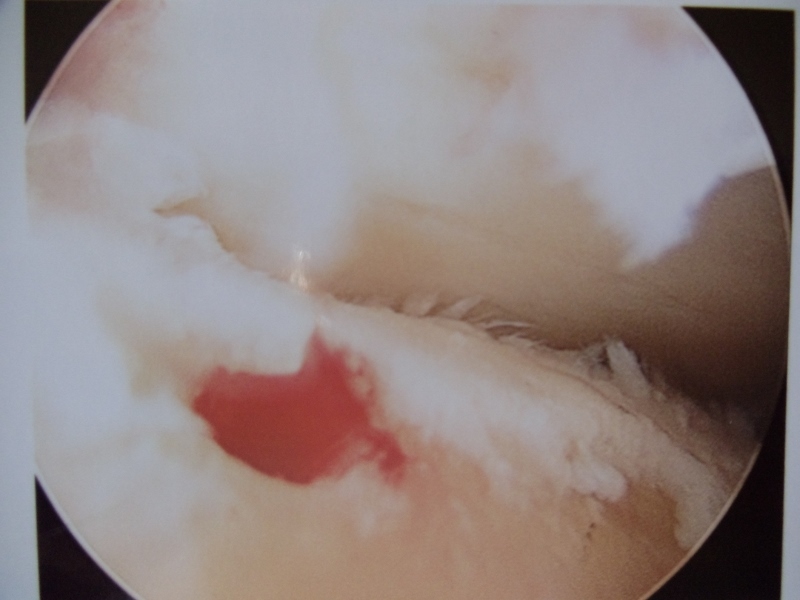 This stiffness and pain will be present for a proportional period of time usually to the degree of joint injury. 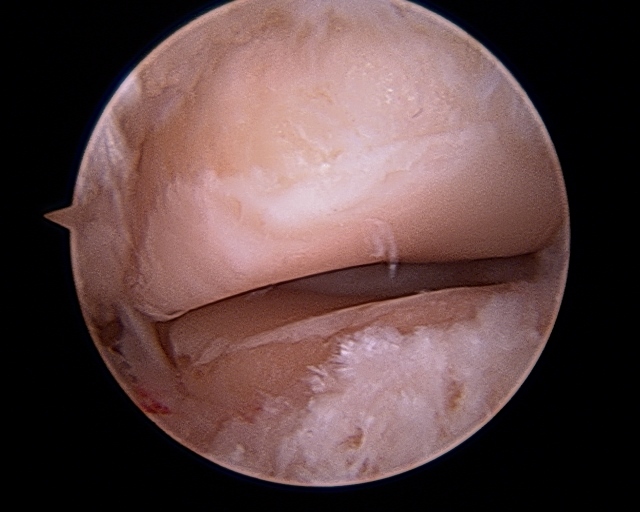 With weightbearing the joint usually loosens and the person is able to ambulate. 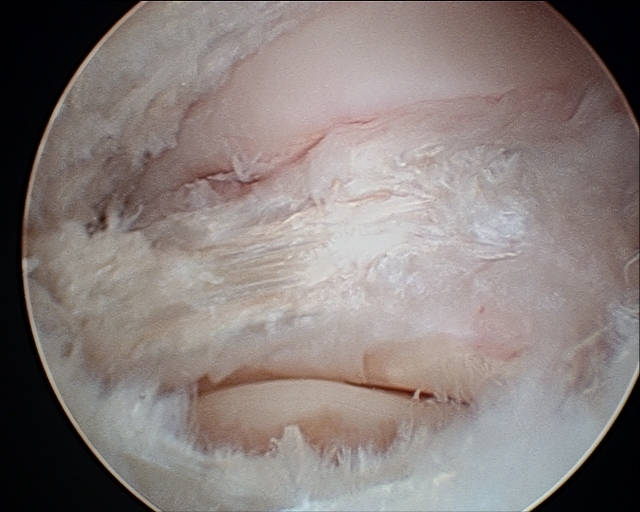 This stiffness and pain will redevelop if the person sits for a period of time and tries to get up and walk. 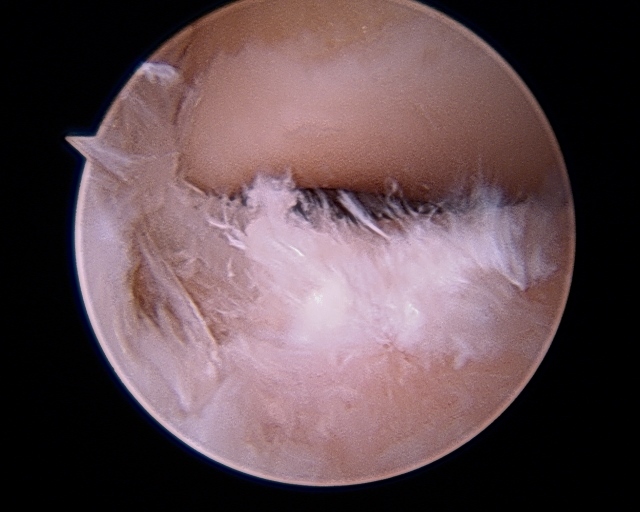 As the day goes on the foot or ankle may ache, especially with excessive weightbearing. 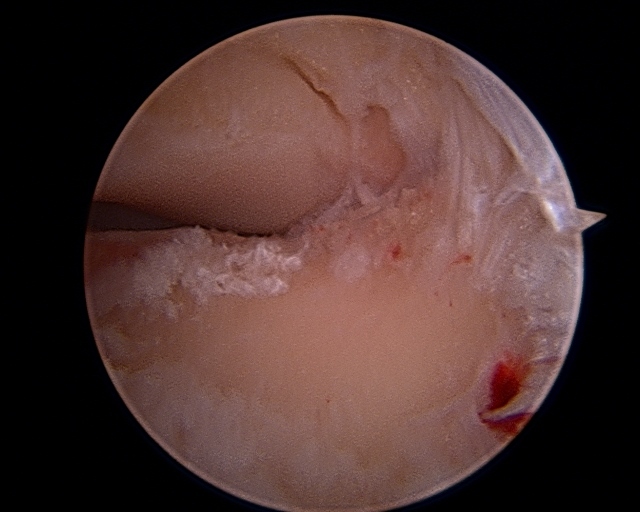 Swelling may be present over the area that is injured. 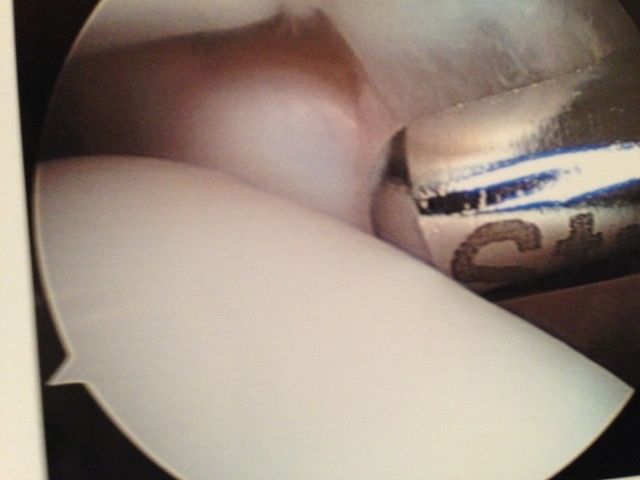 Instability may develop if the ligaments have been injured causing the foot or ankle to constantly twist. 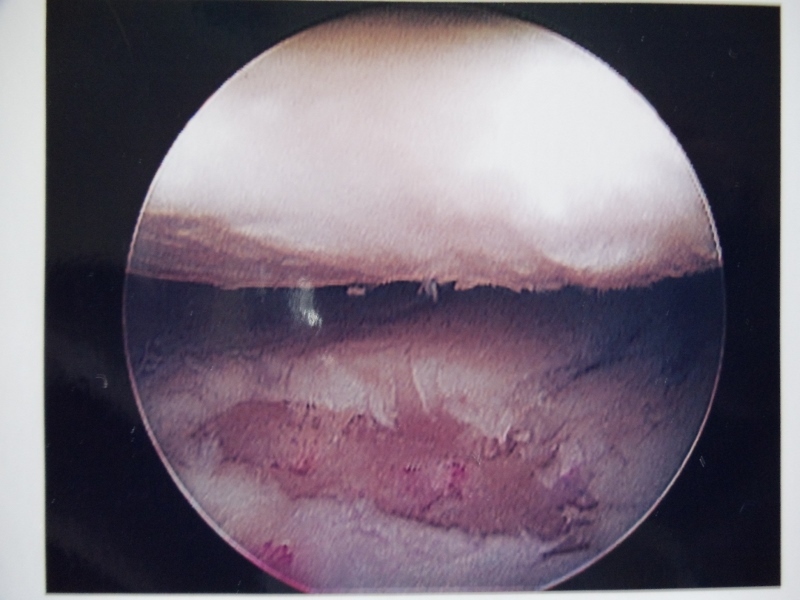 When these injuries are unresponsive to conservative treatment which may include orthotics, medication or rehabilitation, arthroscopic surgery may be necessary to remove the damaged tissue in the foot and ankle. 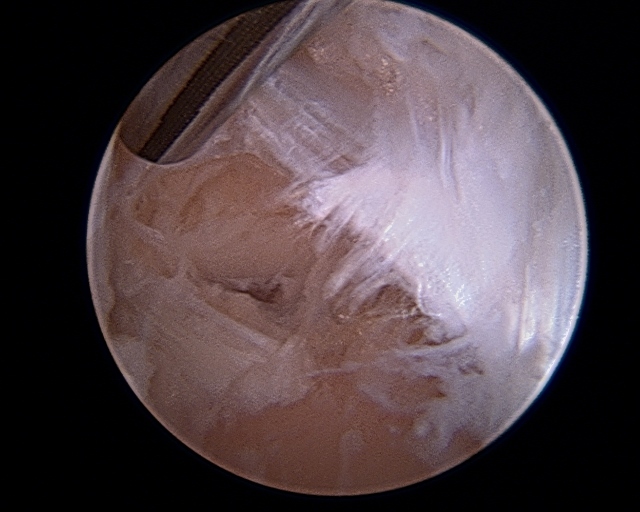 A miniature camera is placed into the injured joint allowing an image to be seen on a television screen. 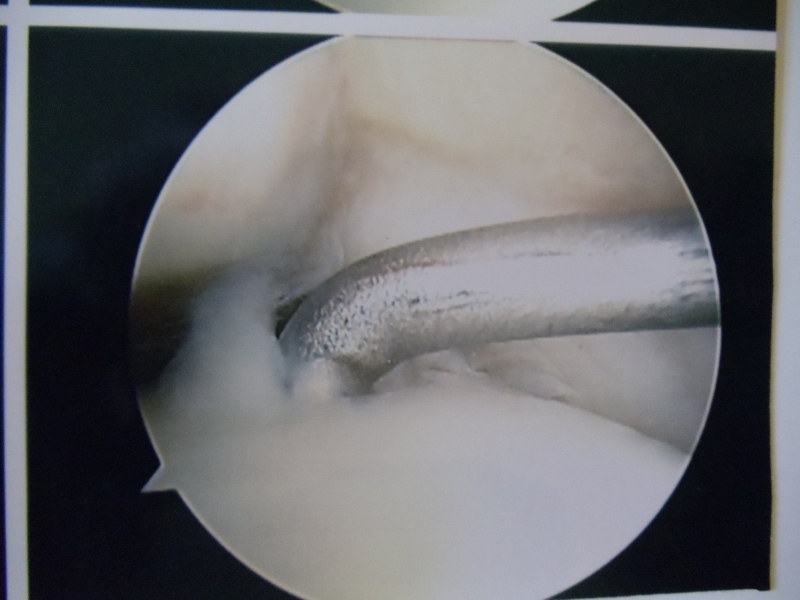 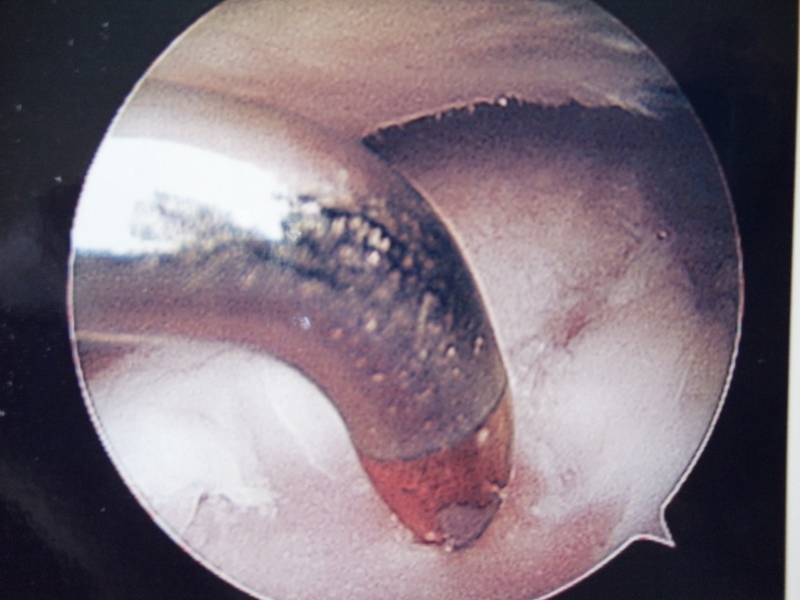 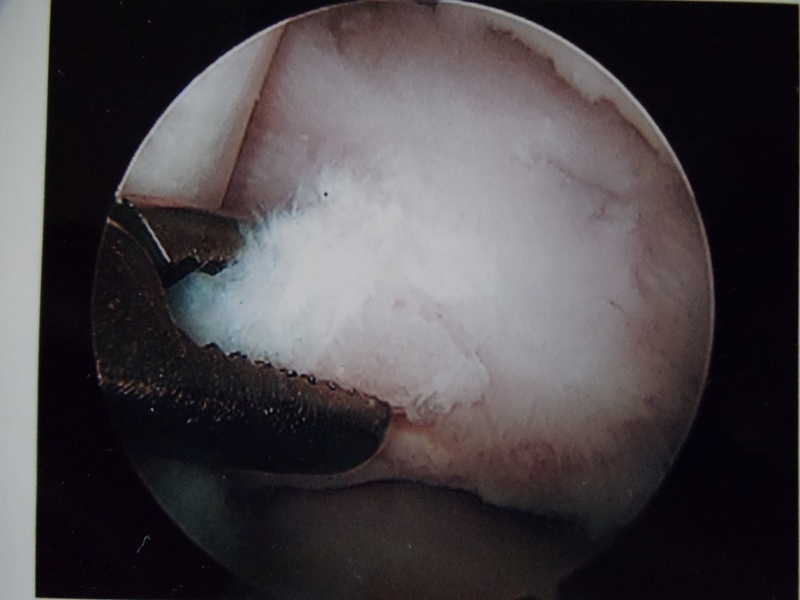 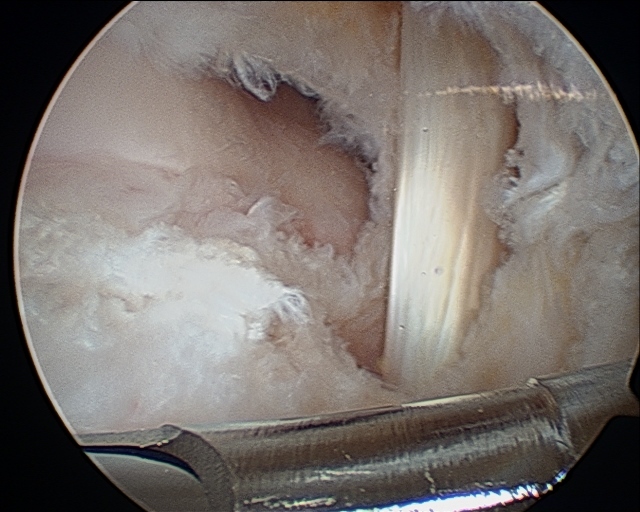 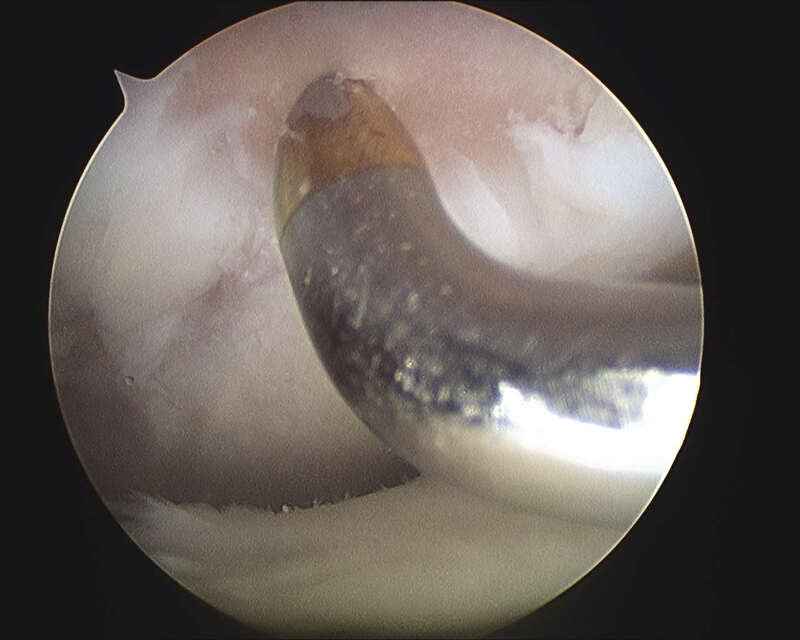 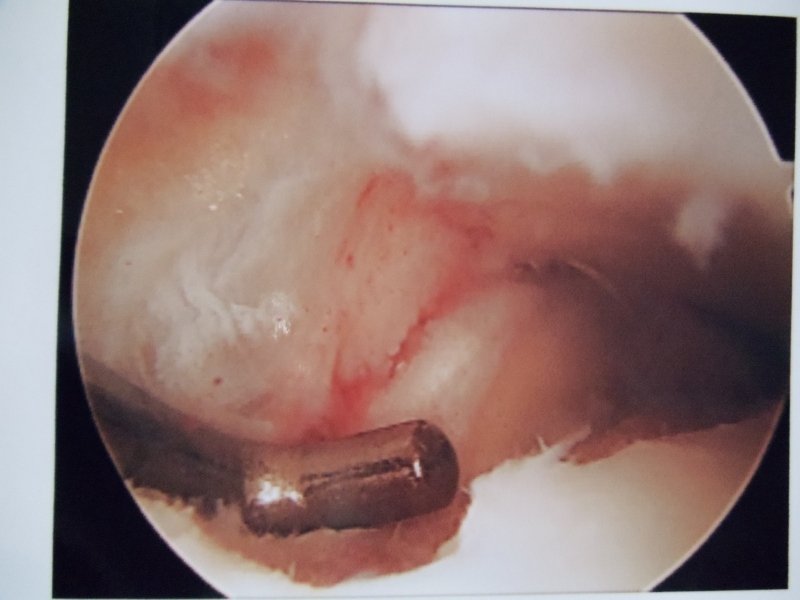 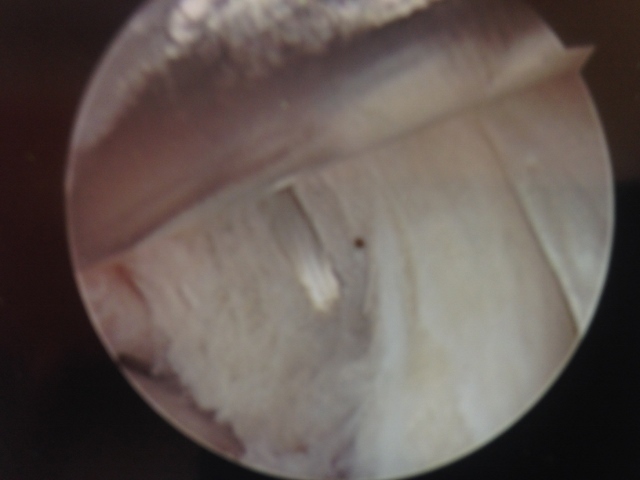 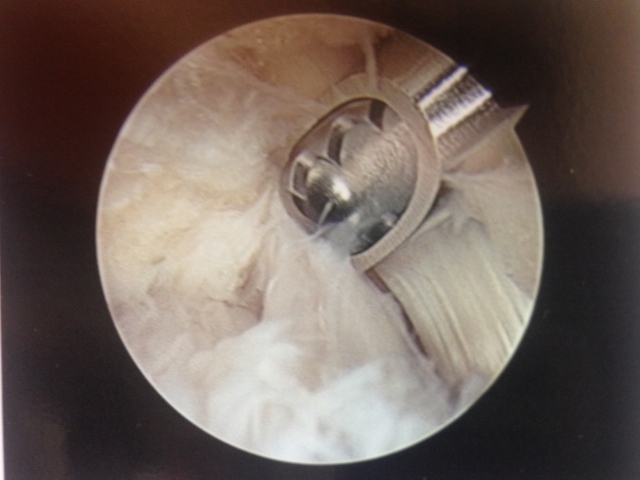 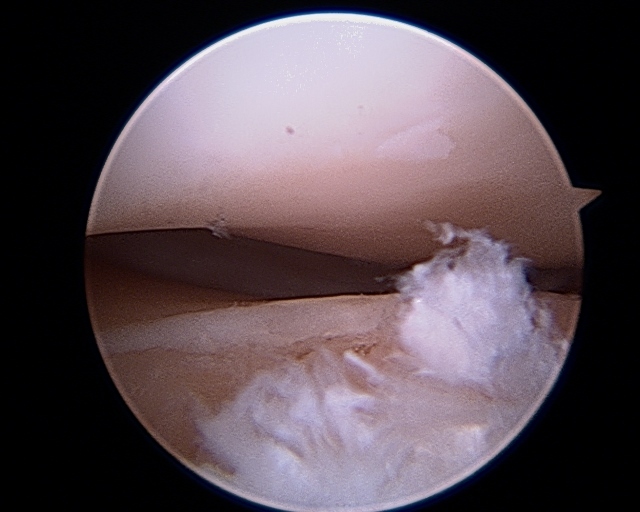 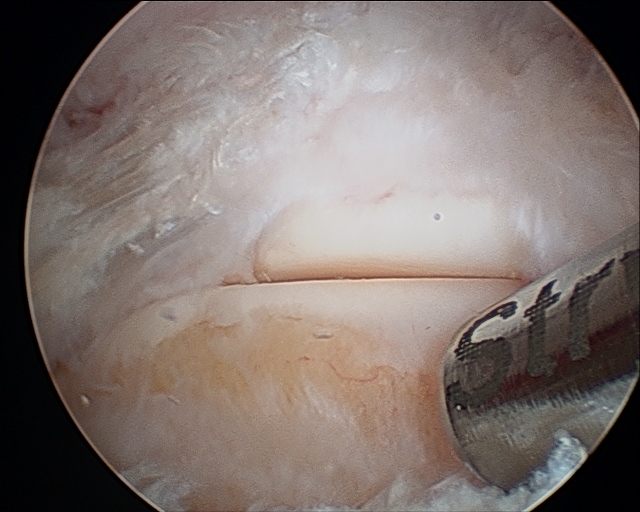 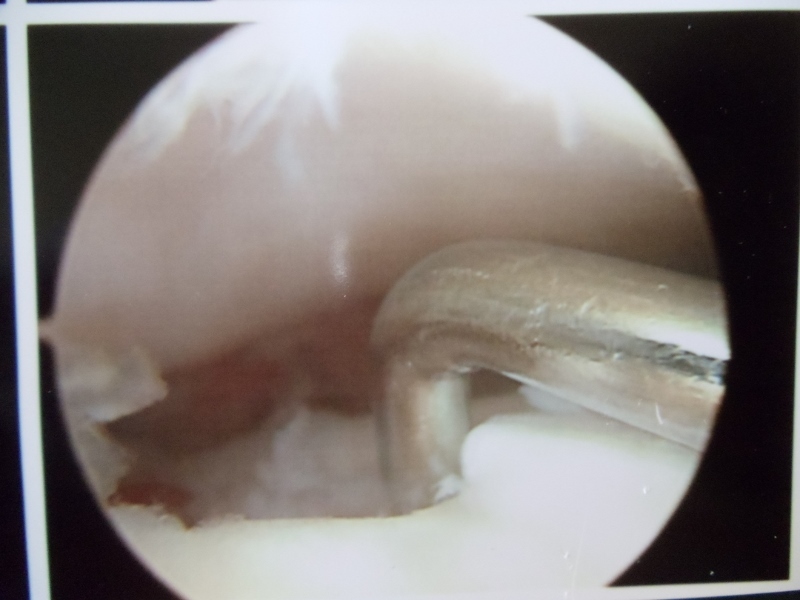 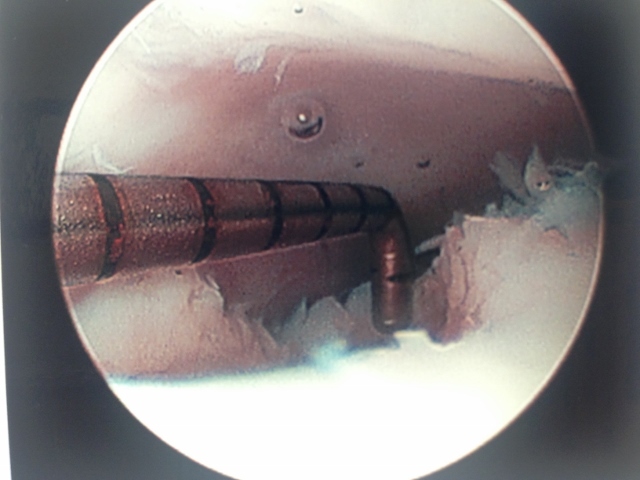 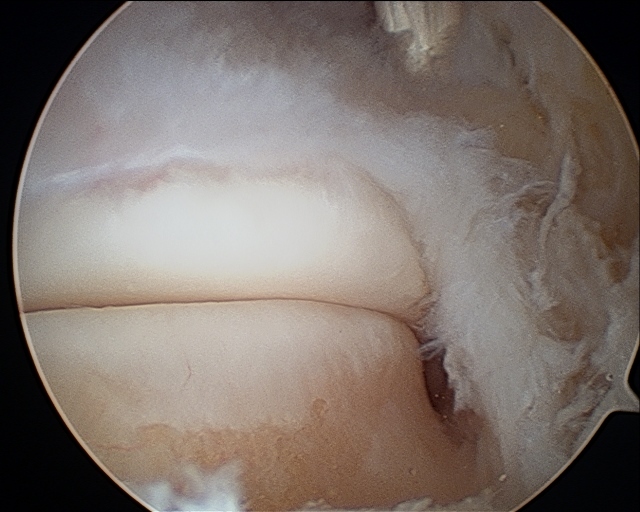 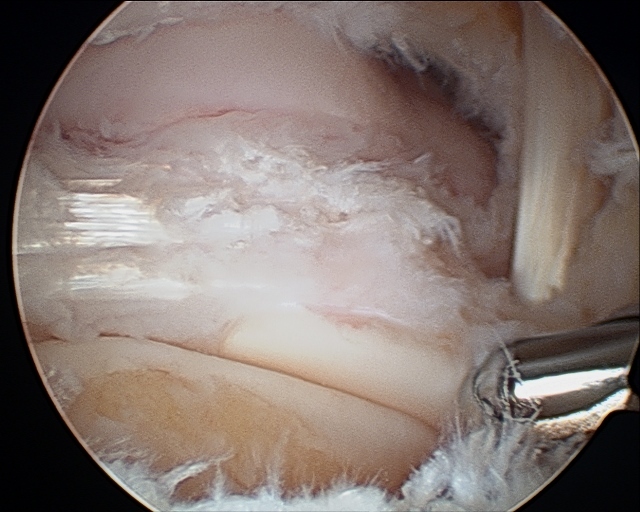 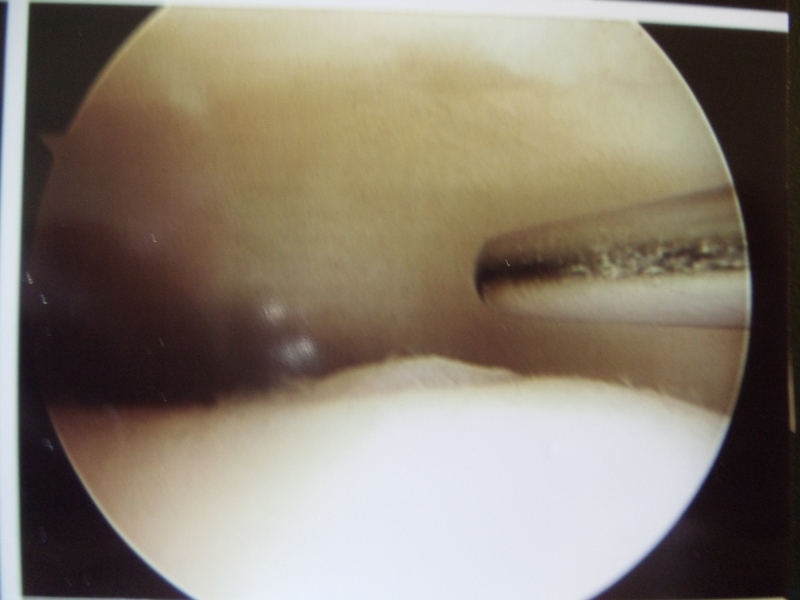 The joint is visualized and small instruments, including laser, are introduced into the joint to clean out and repair the damage. 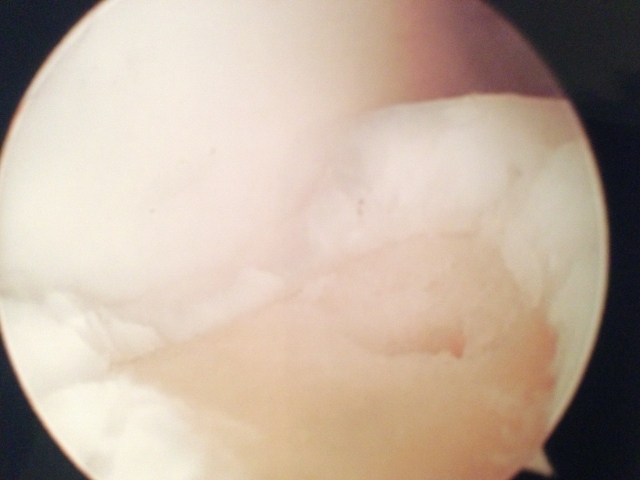 Fragments of bone and cartilage are often removed. 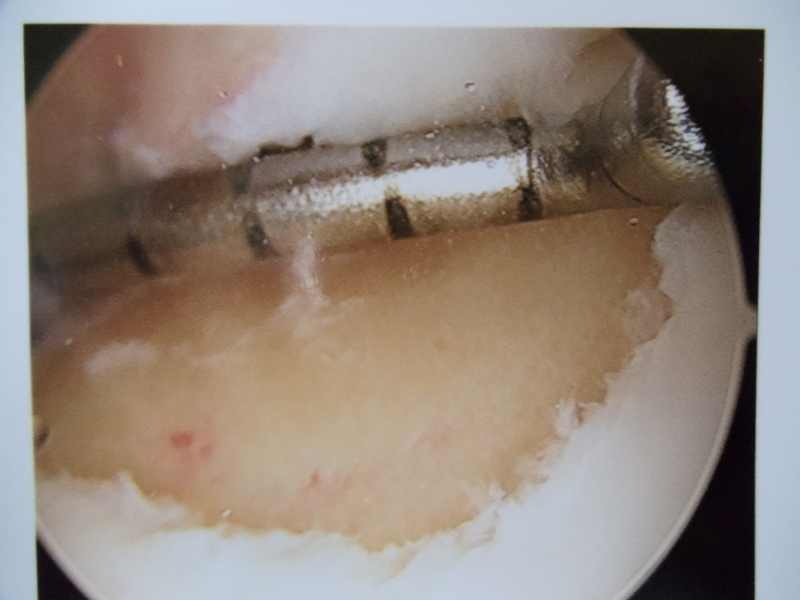 Suctioning of debris and smoothing rough surfaces will often allow a joint to resume its normal gliding motion. 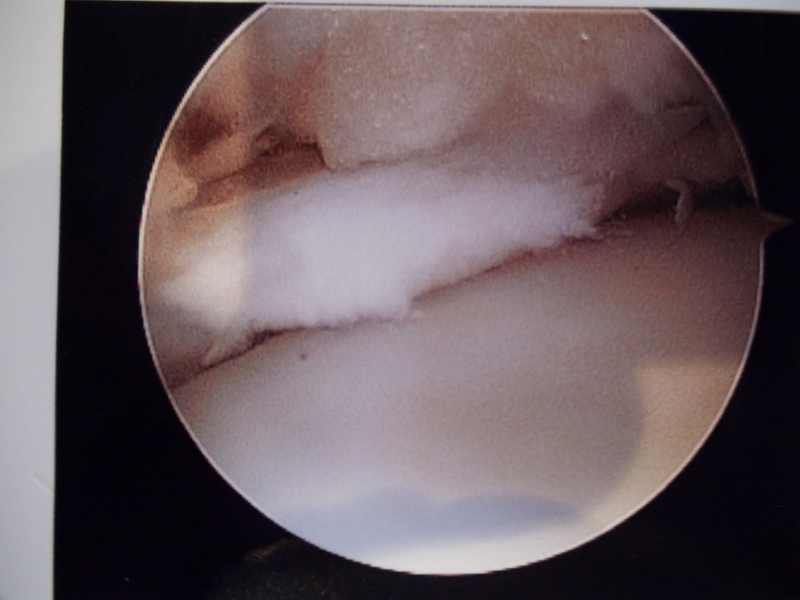 6. ankle fractures that have not completely 6. quicker return to activities. 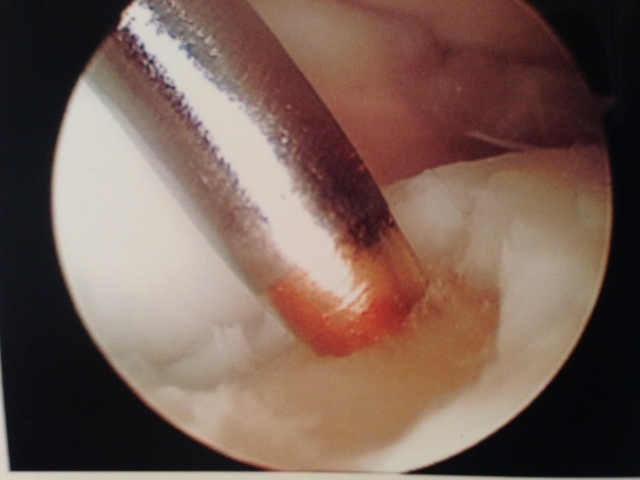 Joints are designed to give our bodies freedom of movement. 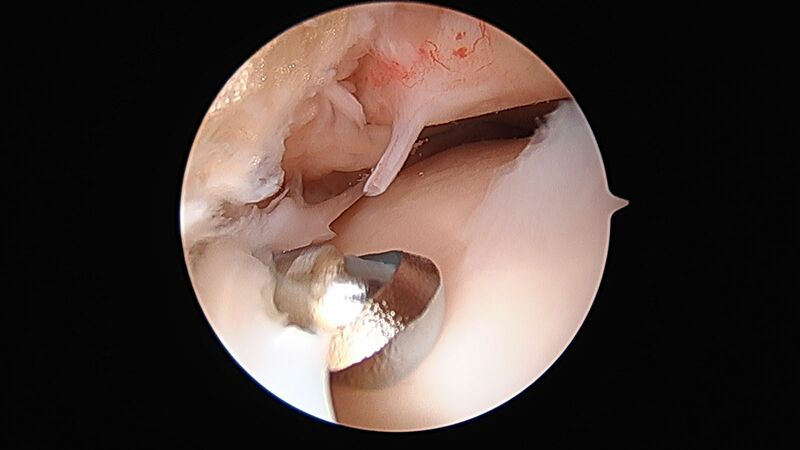 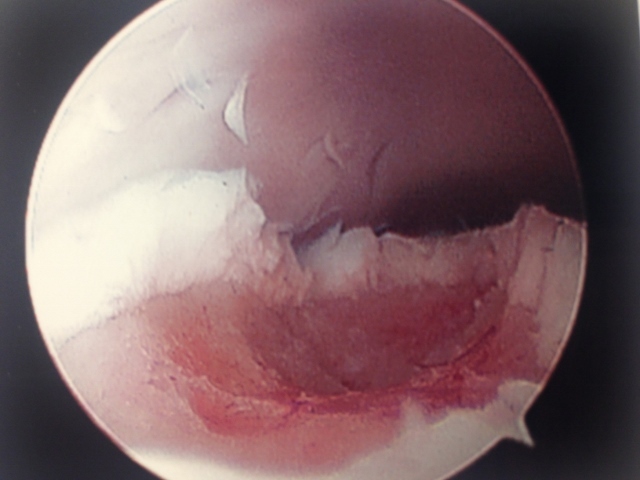 Wear and tear of a joint due to injury or due to aging may alter the lifestyle of an individual. 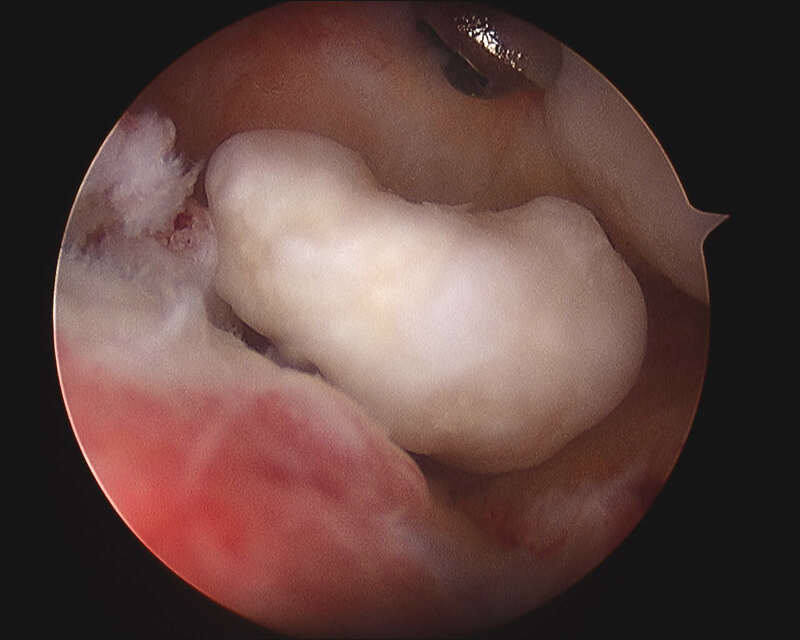 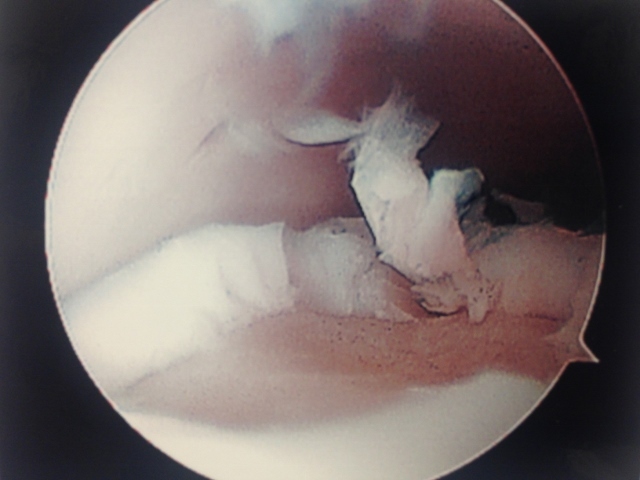 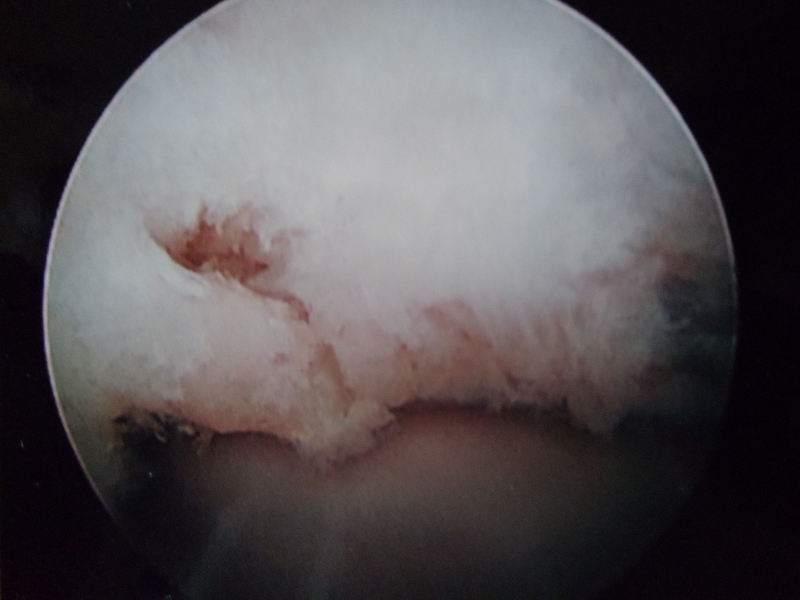 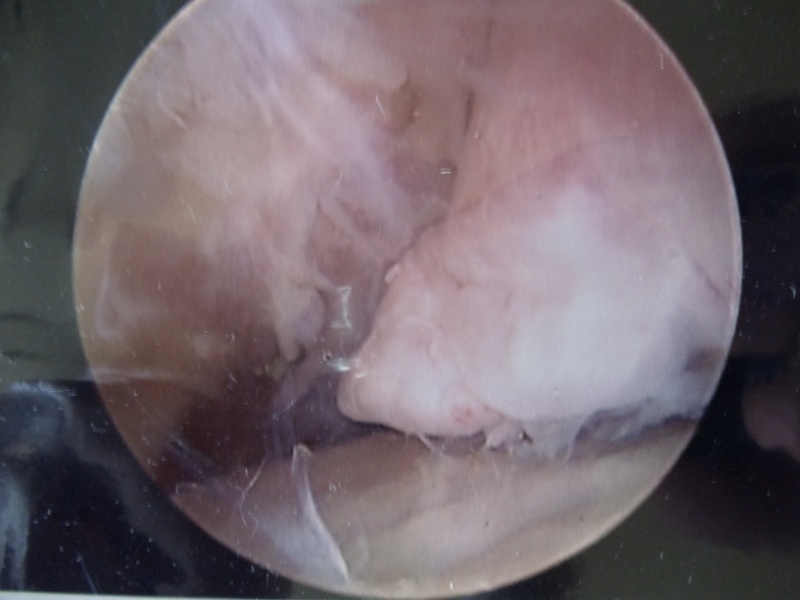 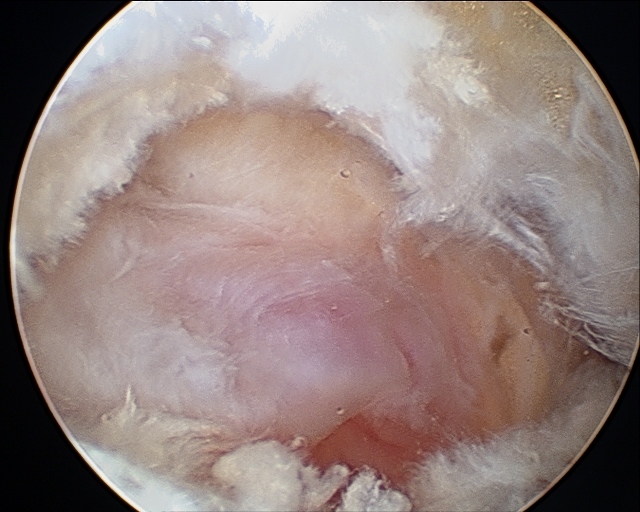 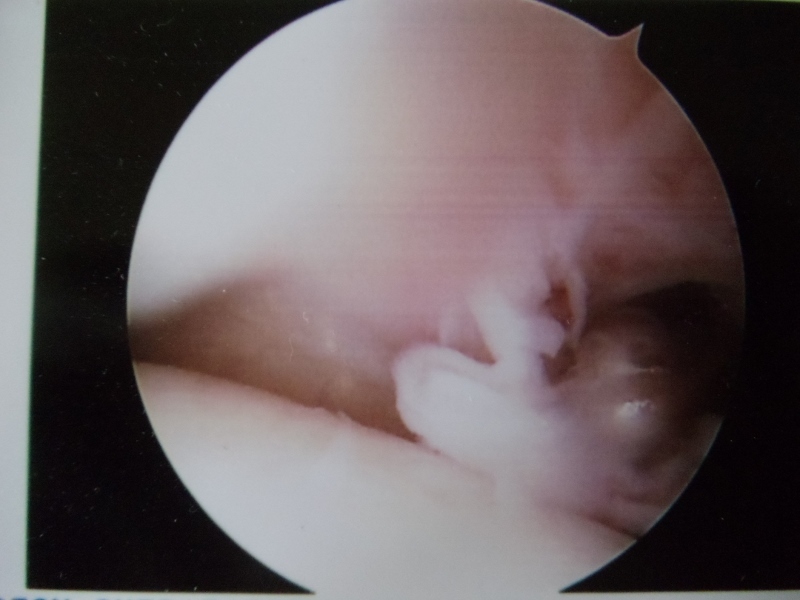 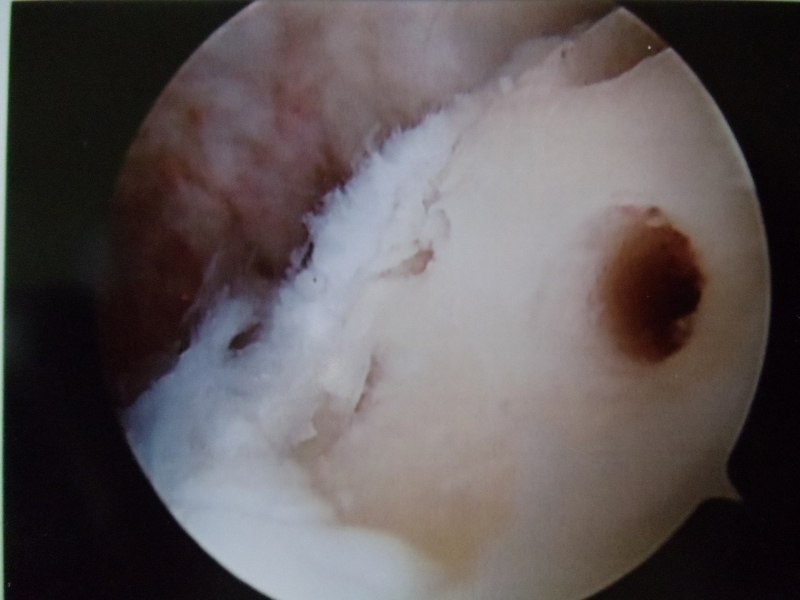 When conservative treatments fail to alleviate the pain and deformity of a joint, arthroscopic surgery should be considered. 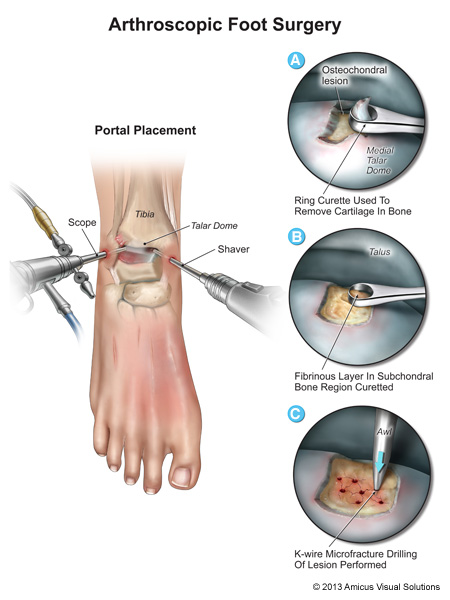 The surgery is especially helpful for a fracture that has occurred to the ankle even after the ankle has been fixed surgically. 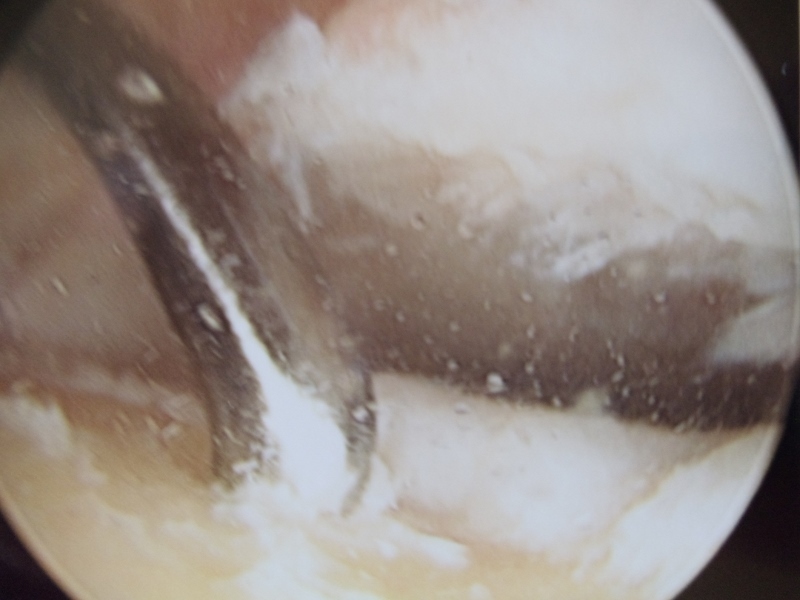 The cartilage in the ankle joint may have been damaged during the injury causing chronic stiffness and pain that may be mild but never goes away completely. 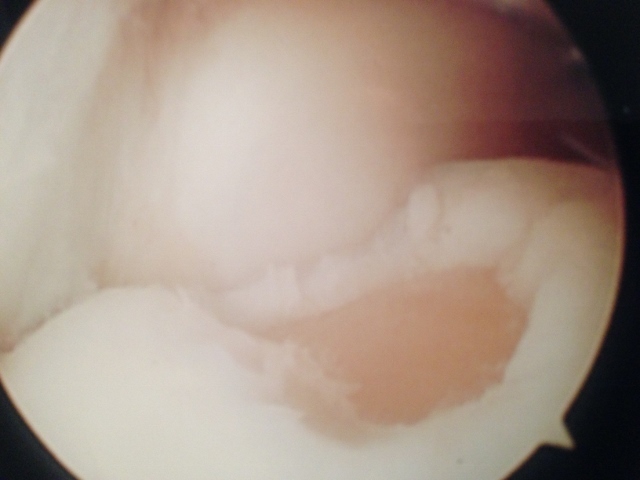 Patients often think that this is a very livable condition. 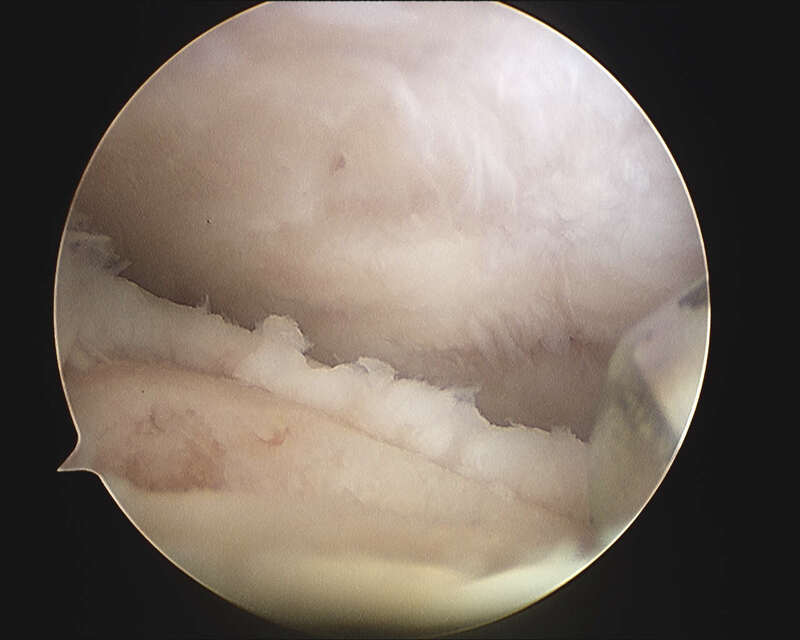 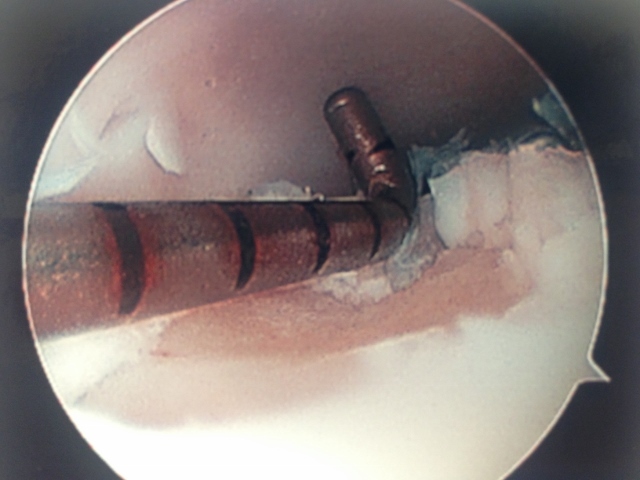 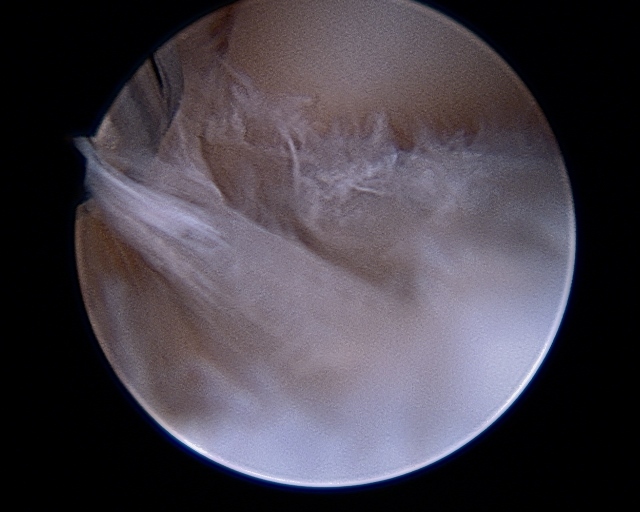 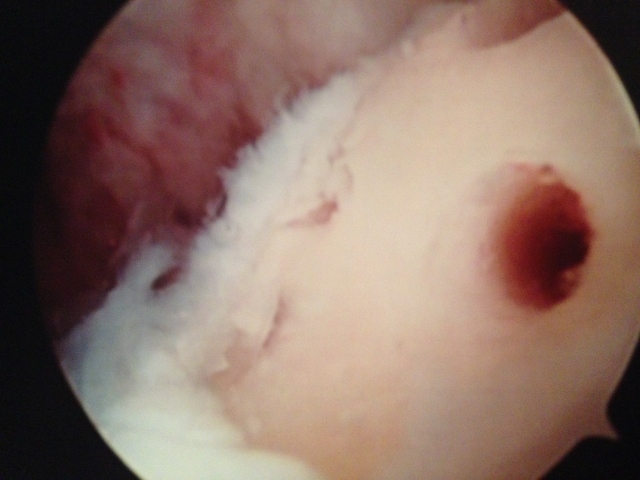 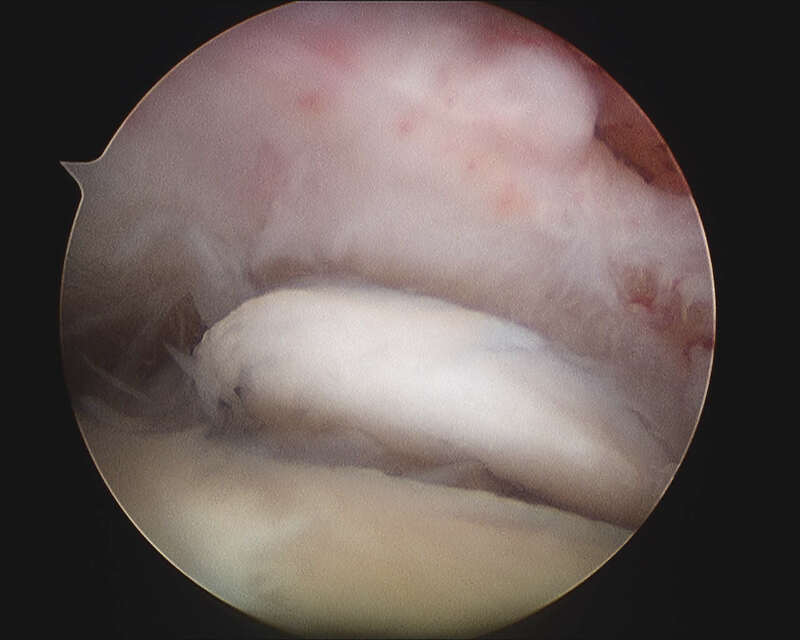 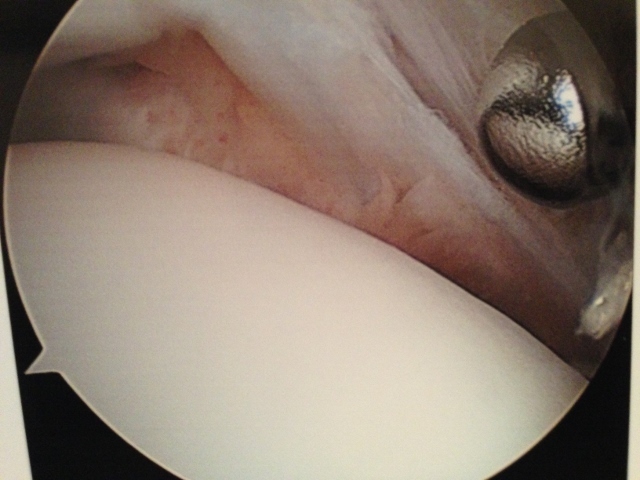 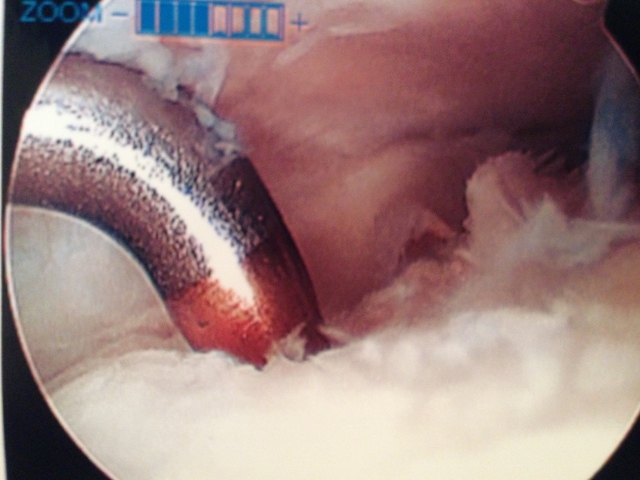 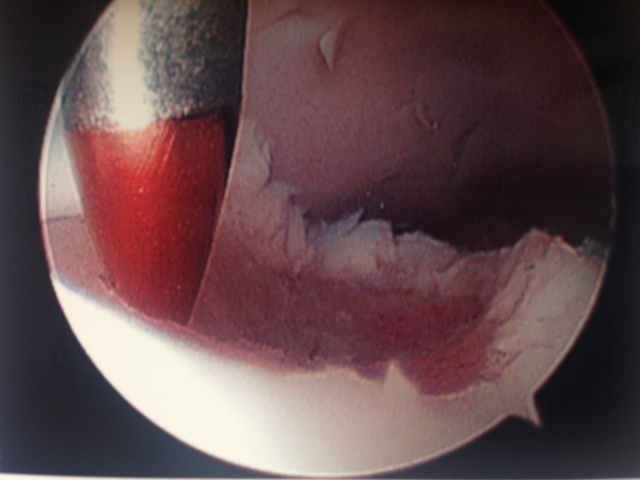 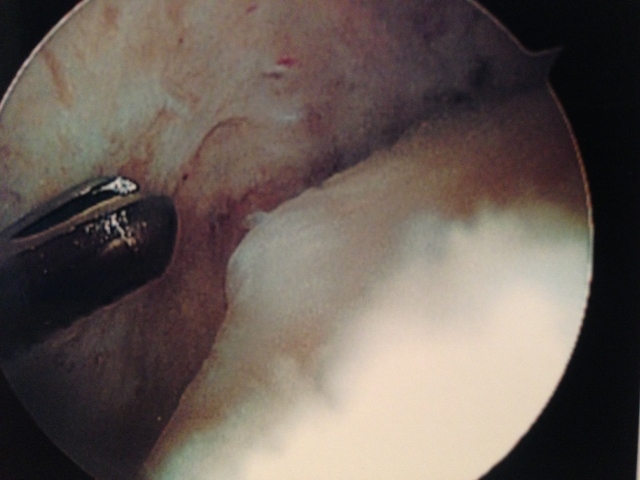 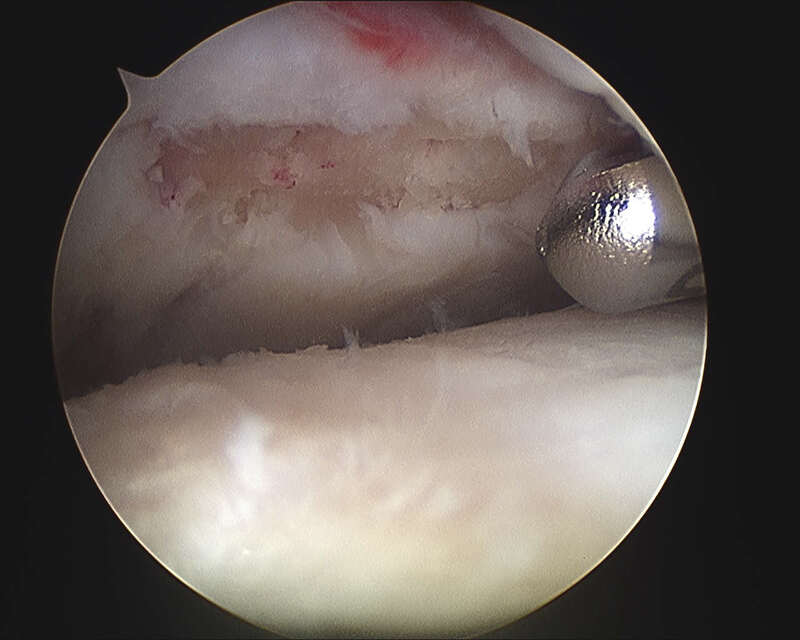 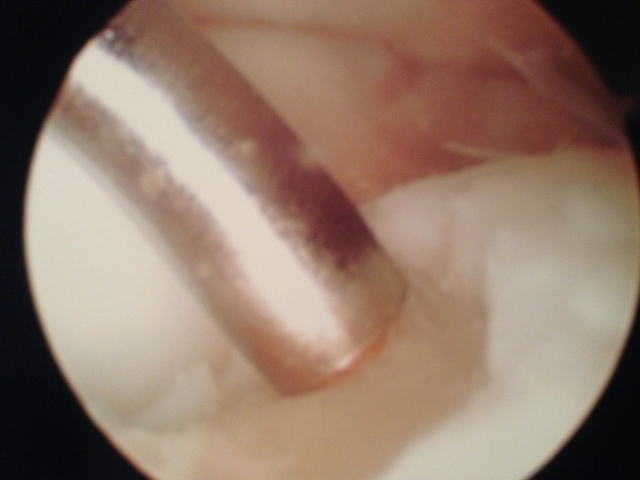 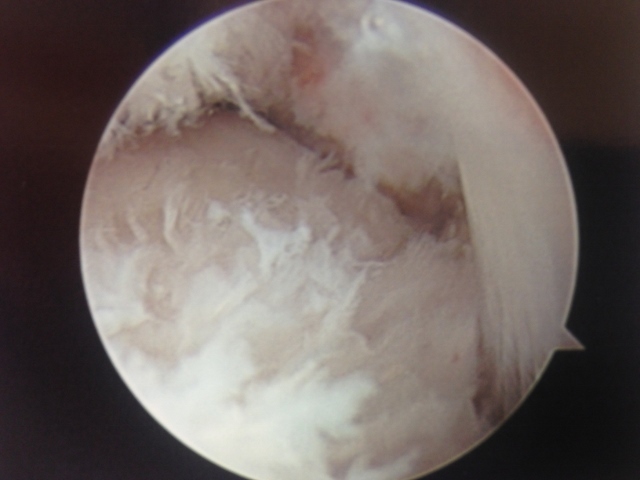 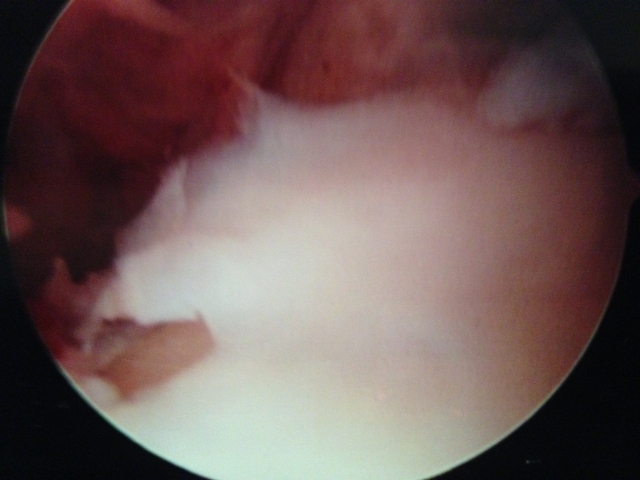 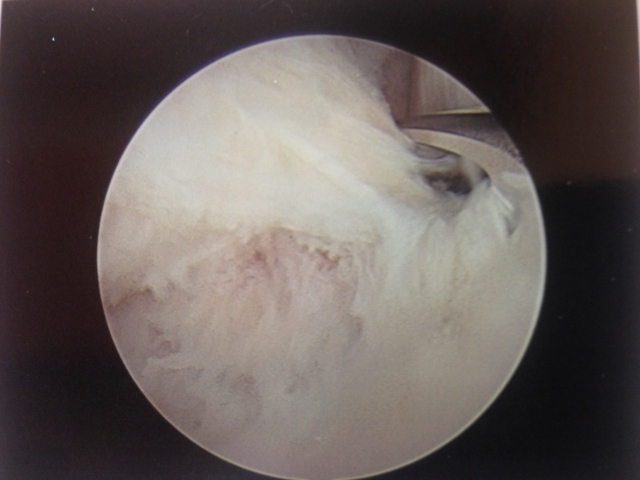 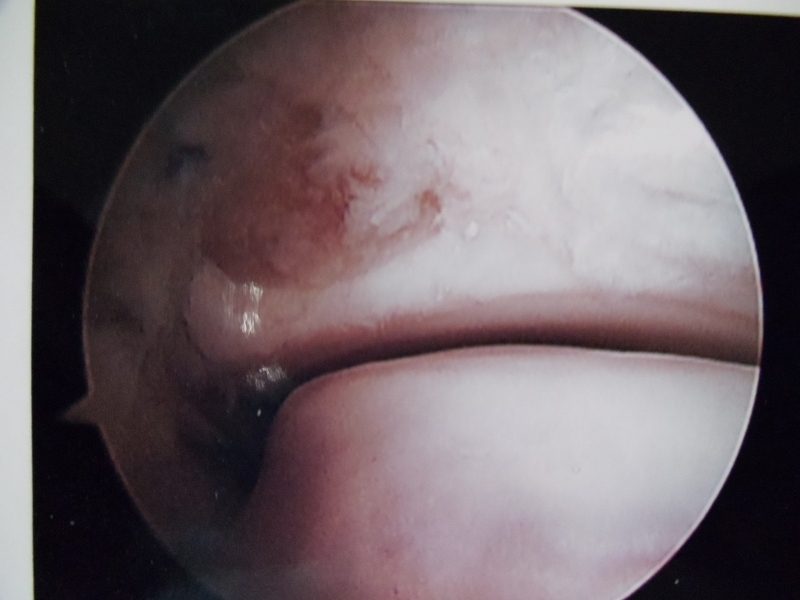 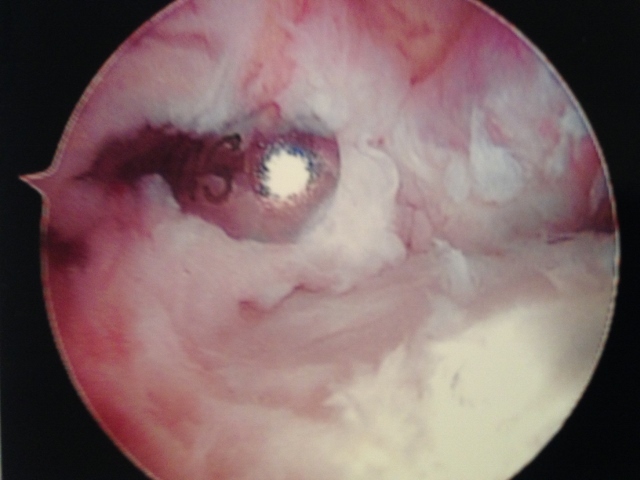 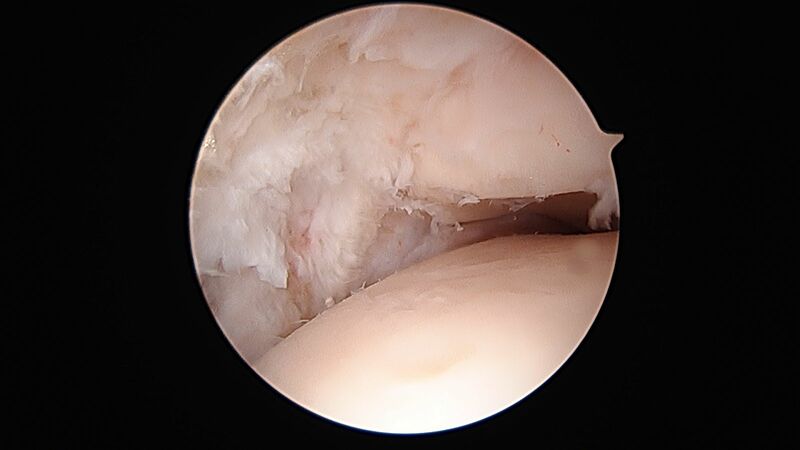 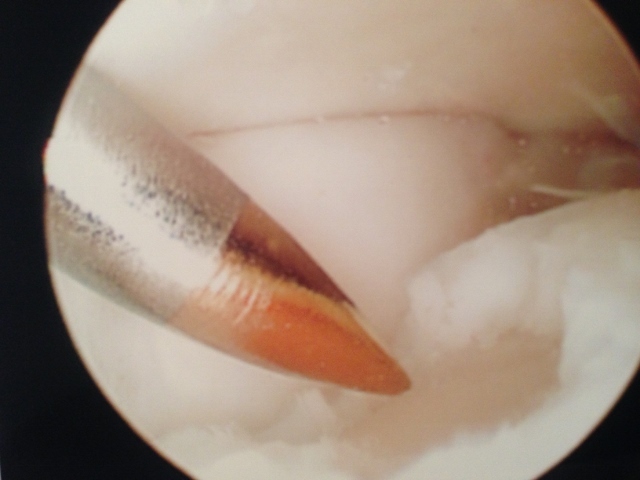 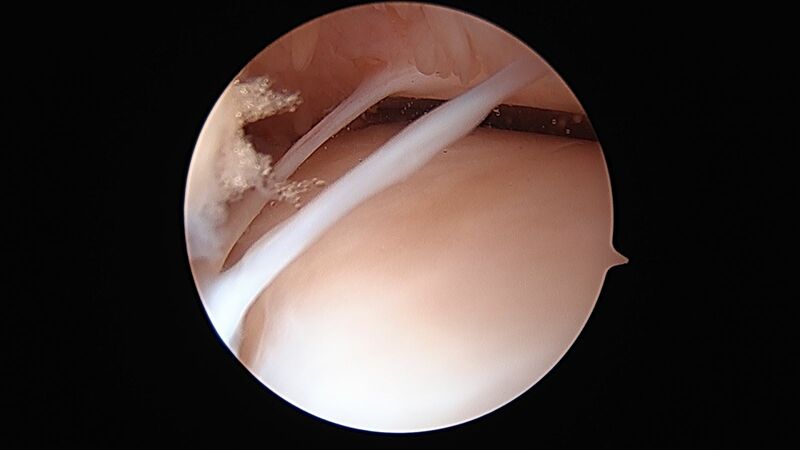 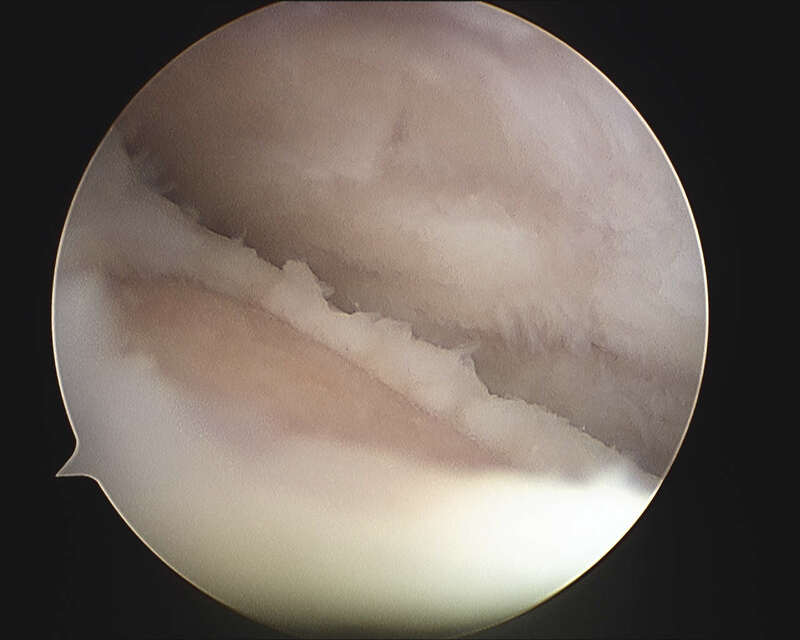 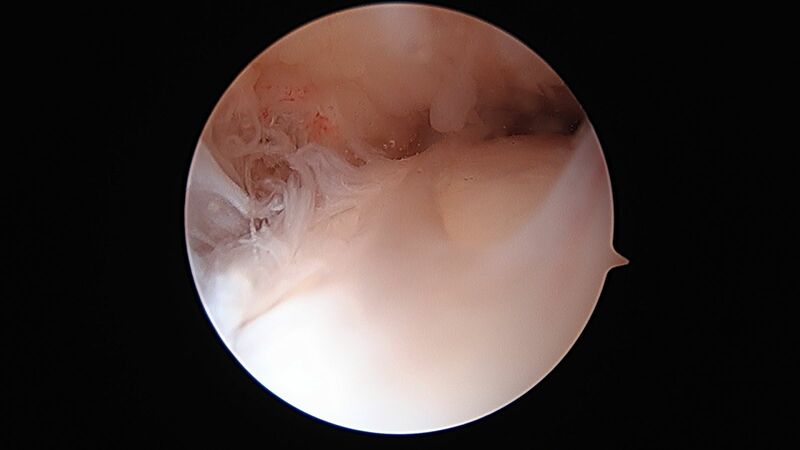 However, once treated arthroscopically a full return to activity may be possible. 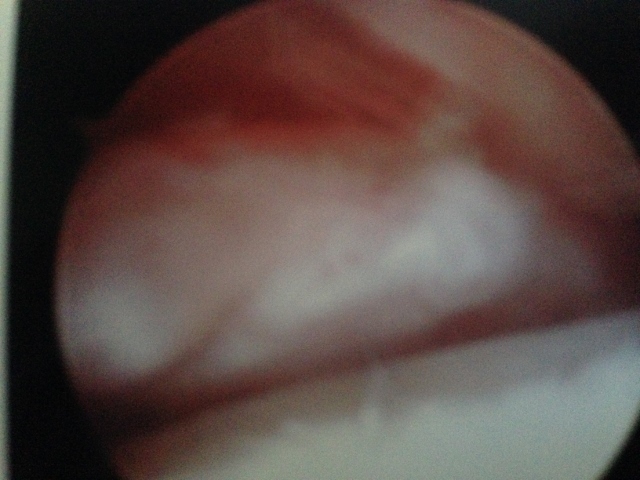 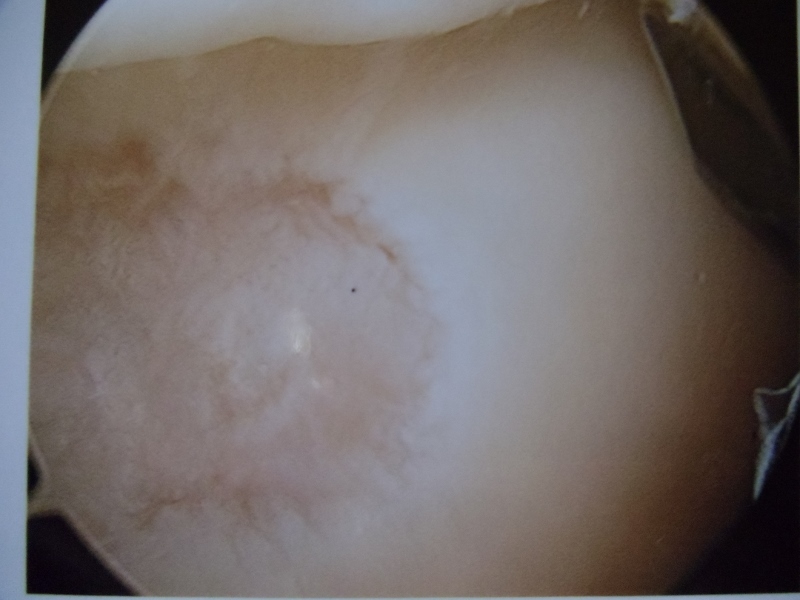 Defect in the cartilage of the Talar dome is debrided of loose and/or damaged cartilage and drill holes are placed into and through the subchondral bone plate to allow bleeding into the area from the bone to allow healing of the area with fibrocartilage which is the cartilaginous version of scar tissue. 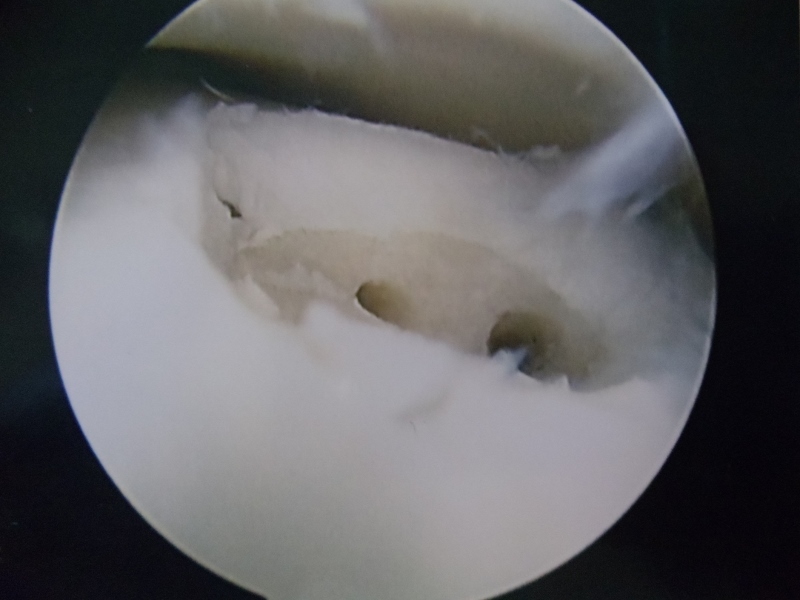 Loose bodies within the ankle joint discovered to the arthroscopy procedure are removed to eliminate irritants in the joint space that lead to swelling and pain. 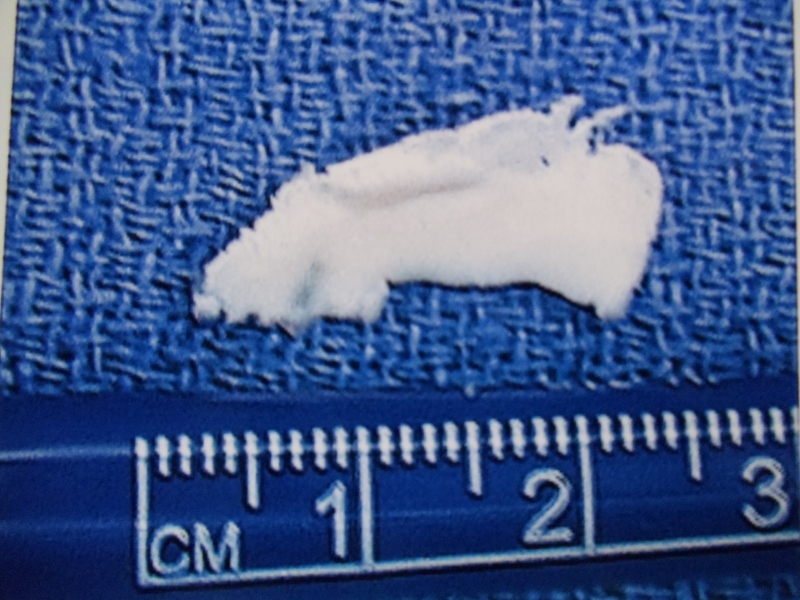 Below, OCD can be seen as the rise in cartilage that causes pain in the ankle. 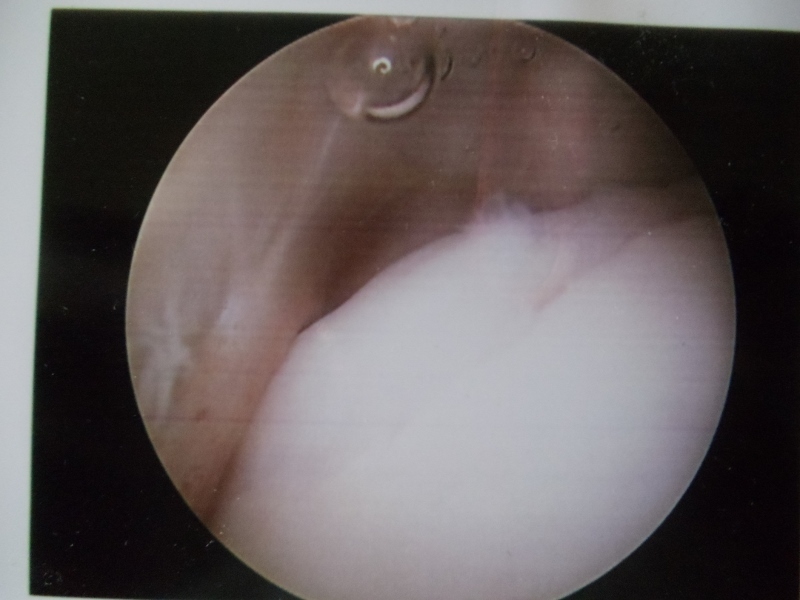 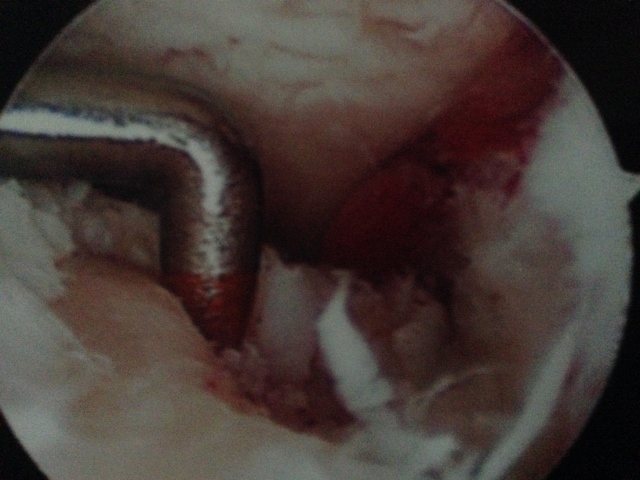 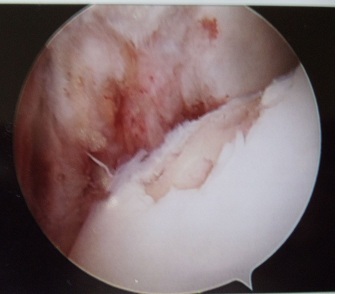 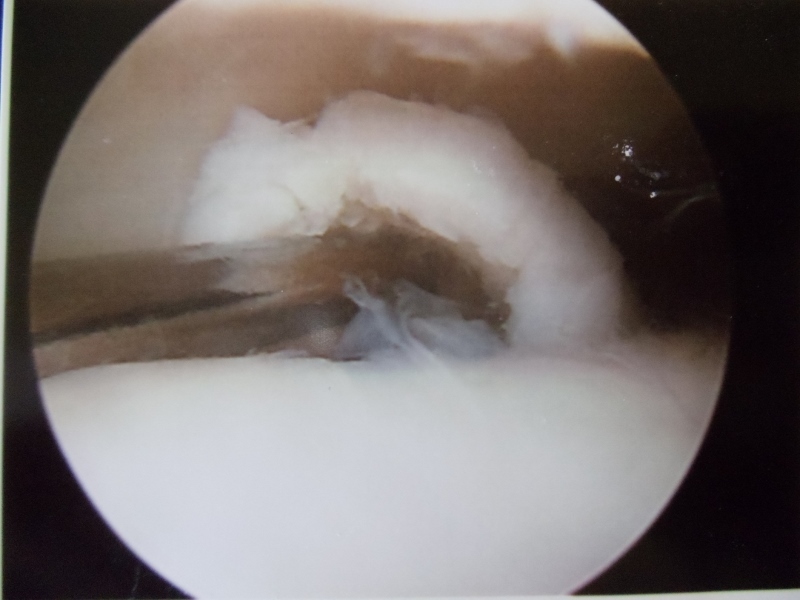 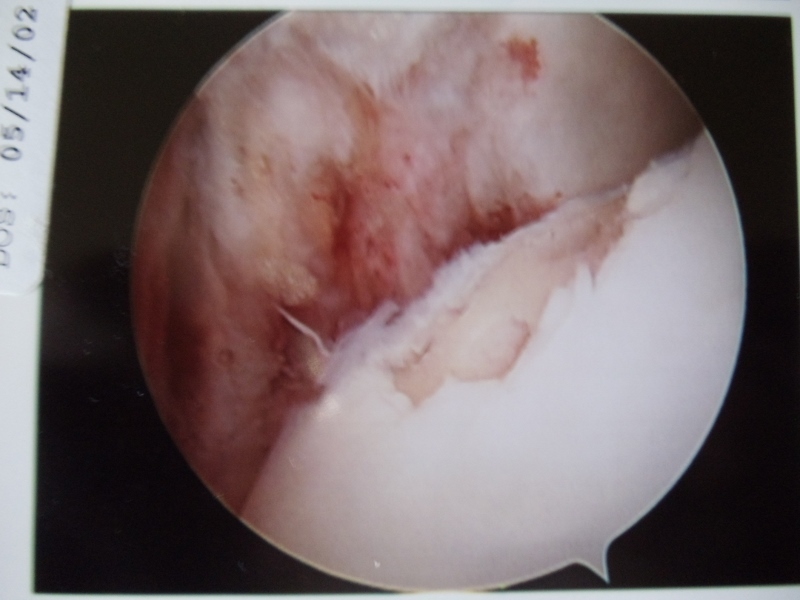 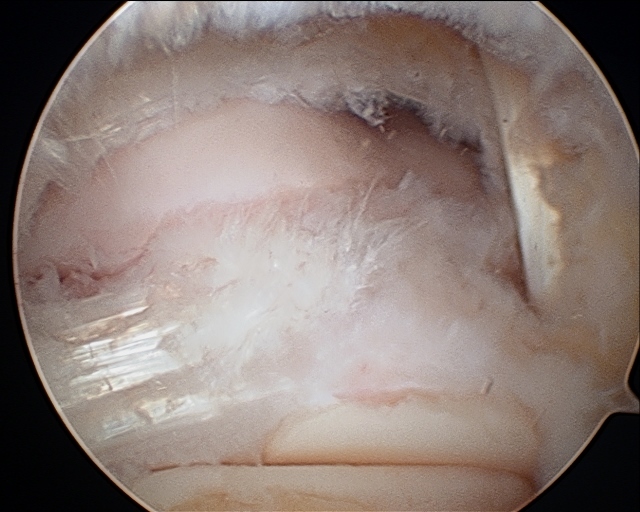 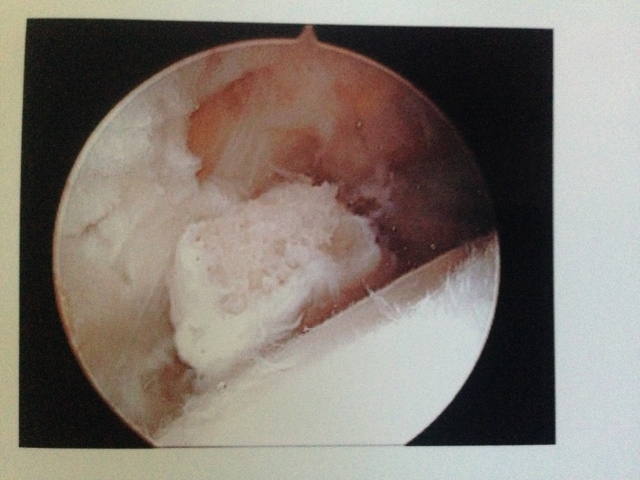 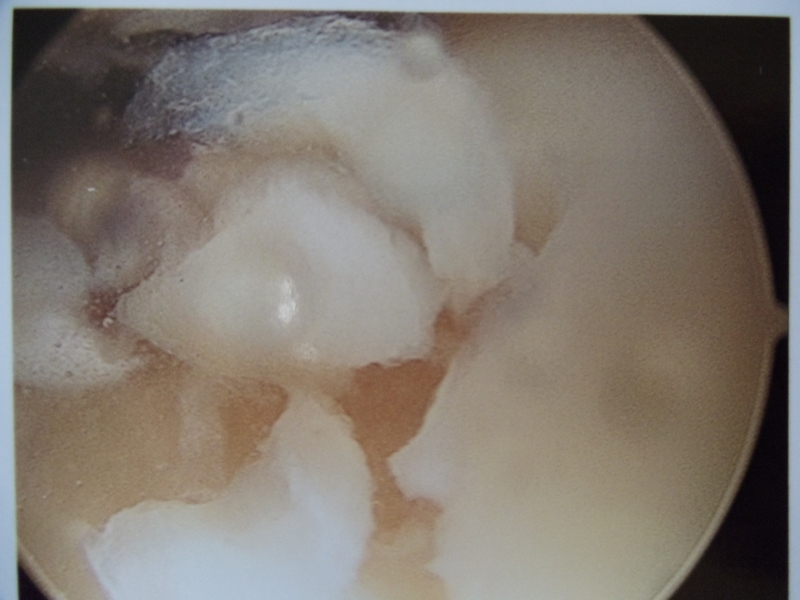 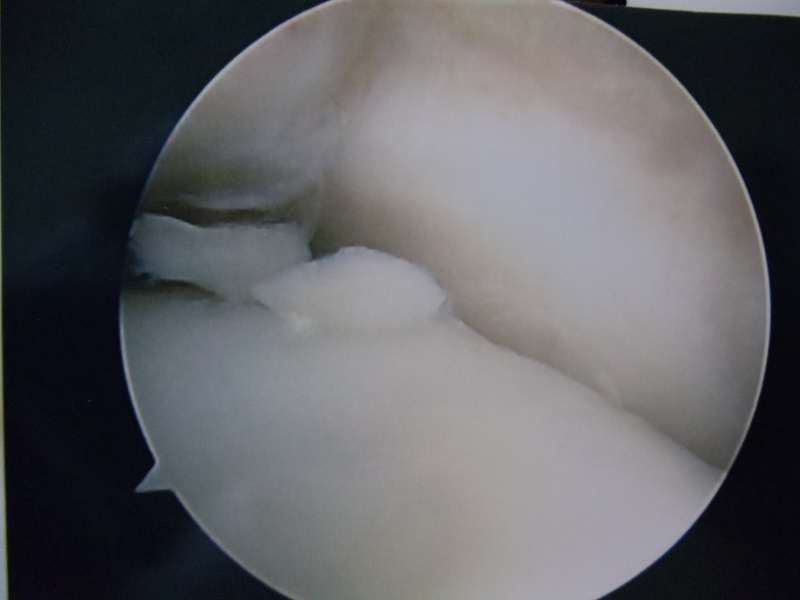 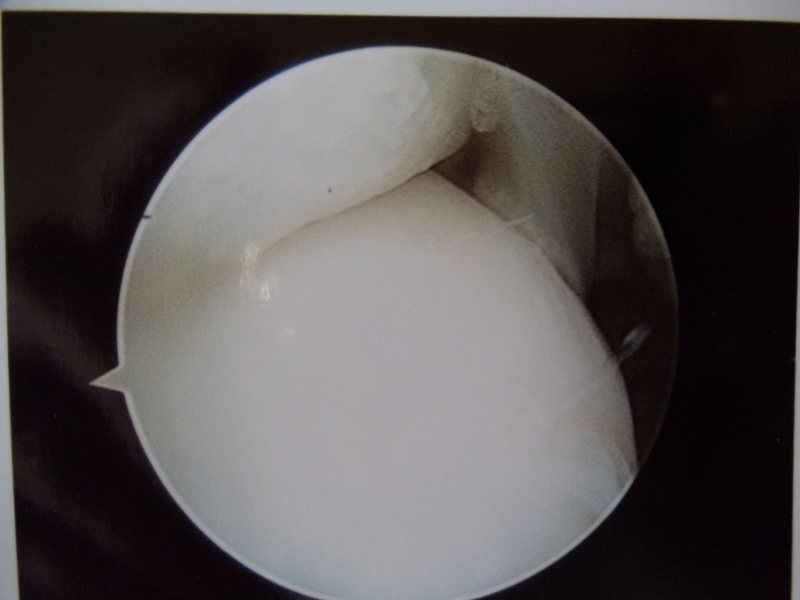 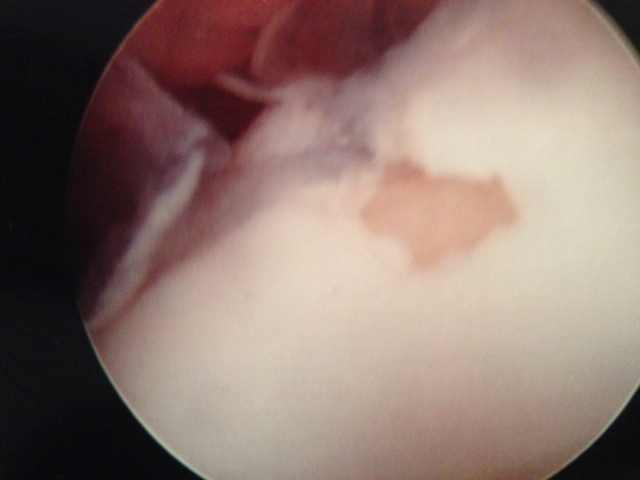 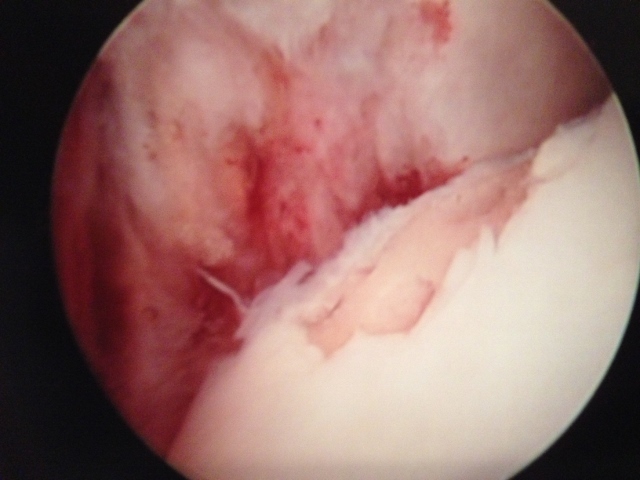 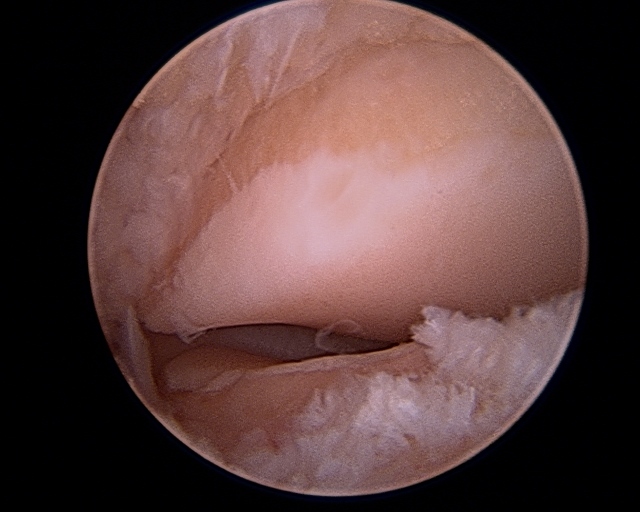 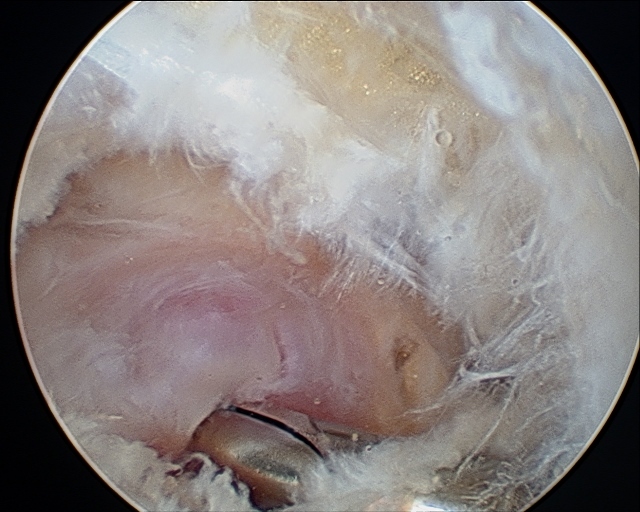 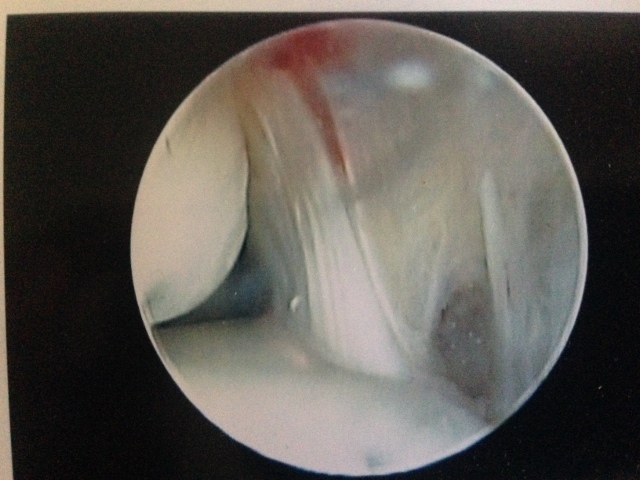 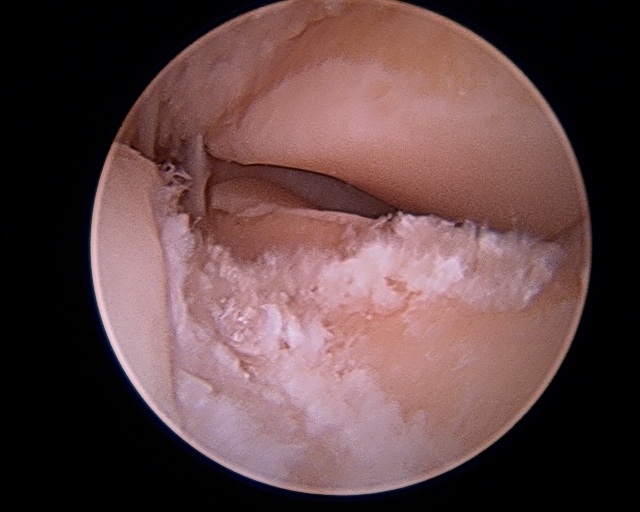 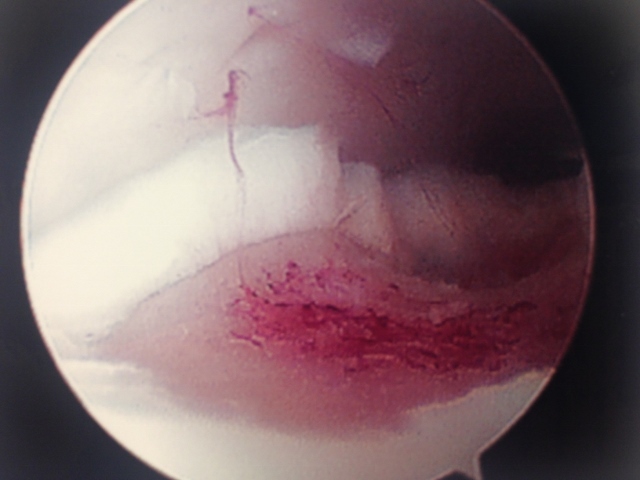 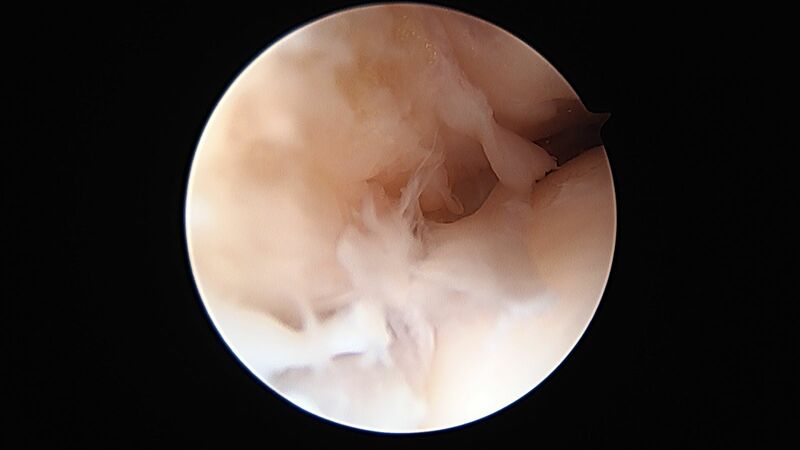 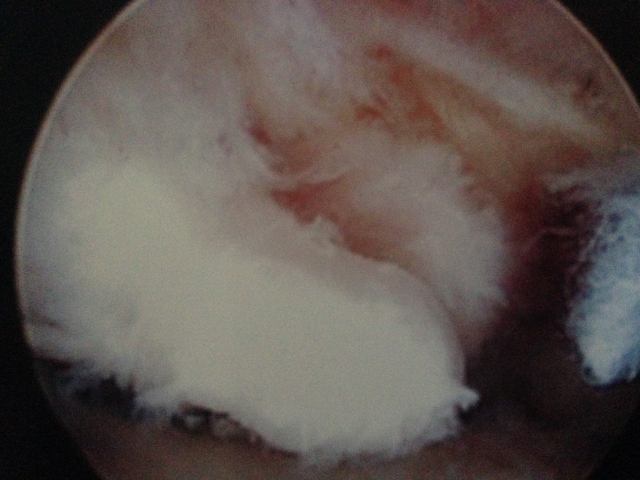 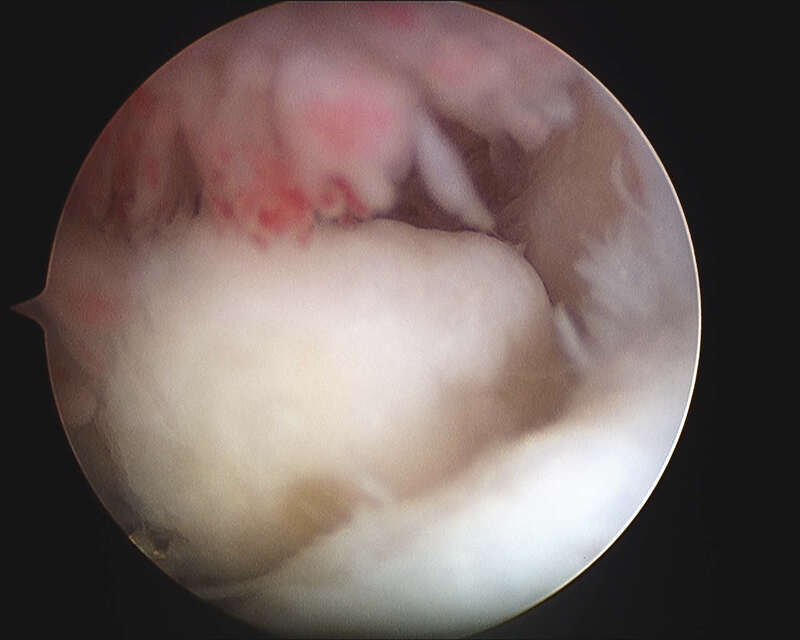 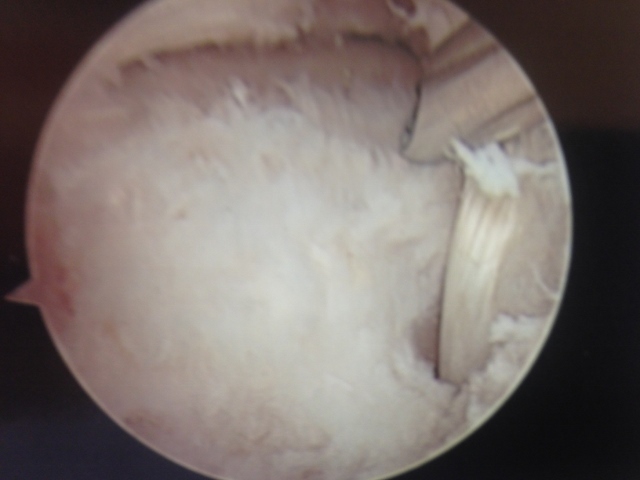 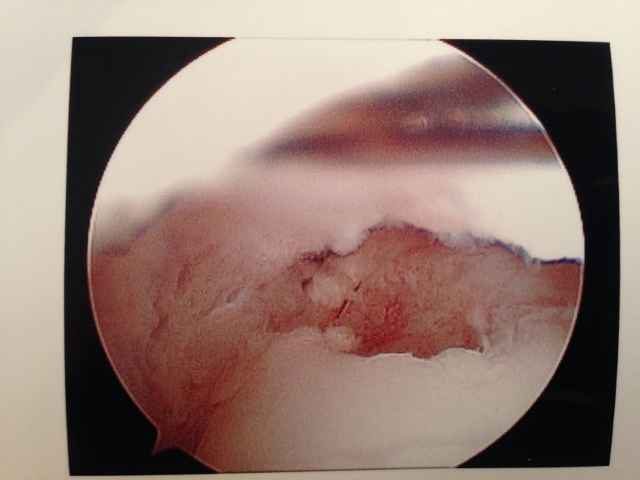 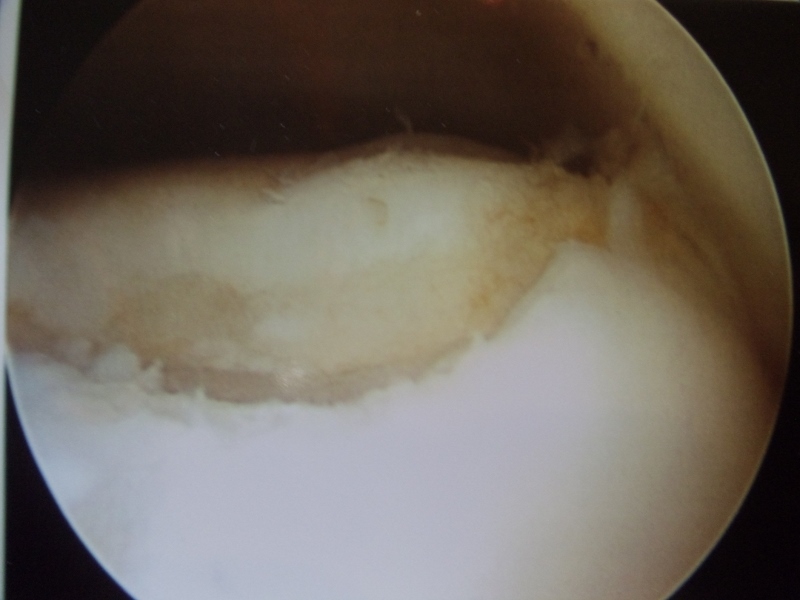 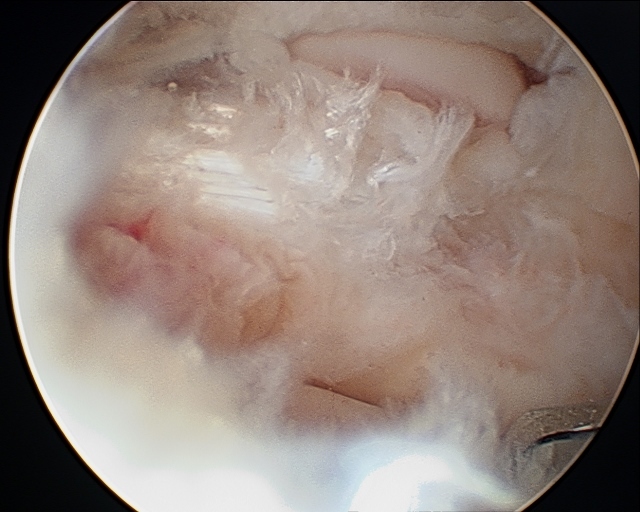 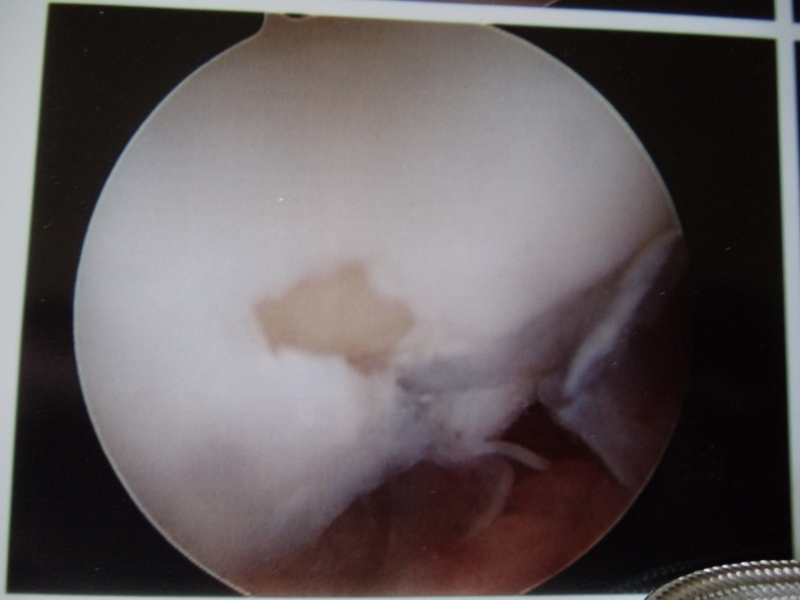 The dmaged cartilage is removed and Microfracture is performed. 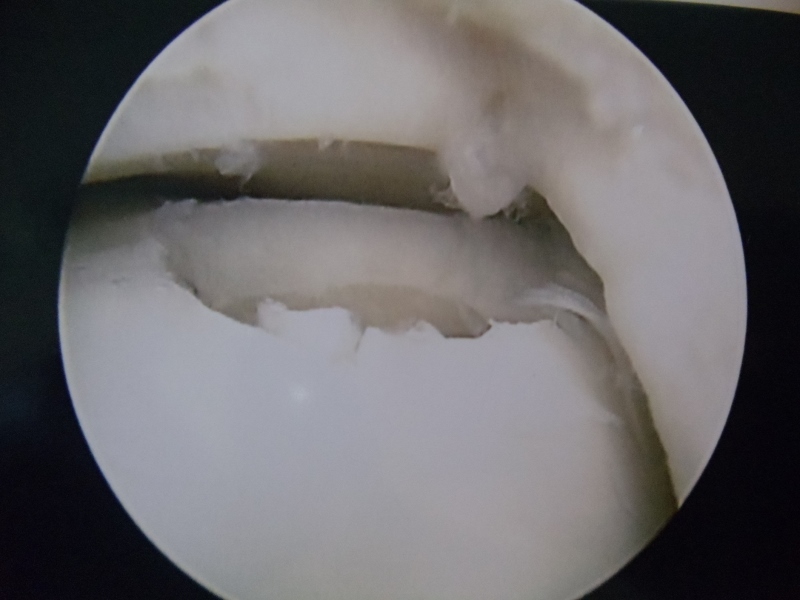 Below, OCD is debrided and microfracture performed of defect. 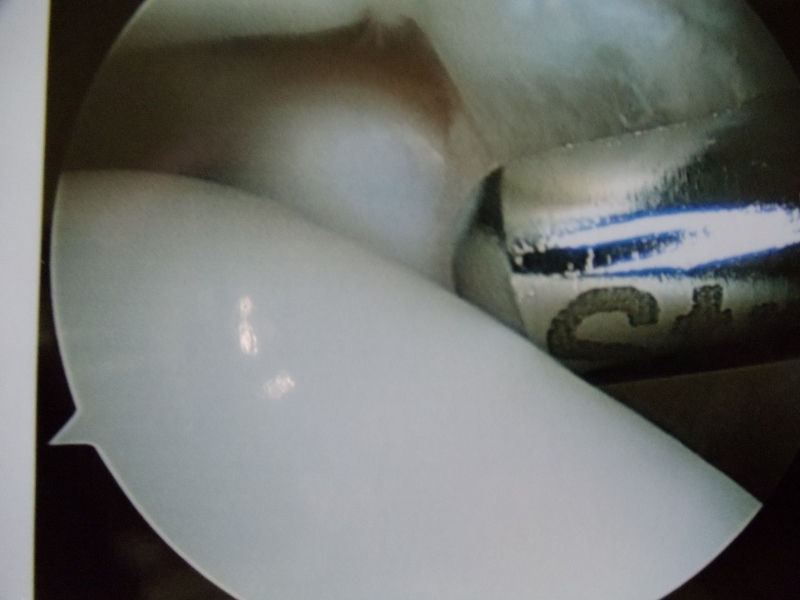 The loose bodies caused depressions in the cartilage of the talus due to constant pressure with range of motion as seen below. 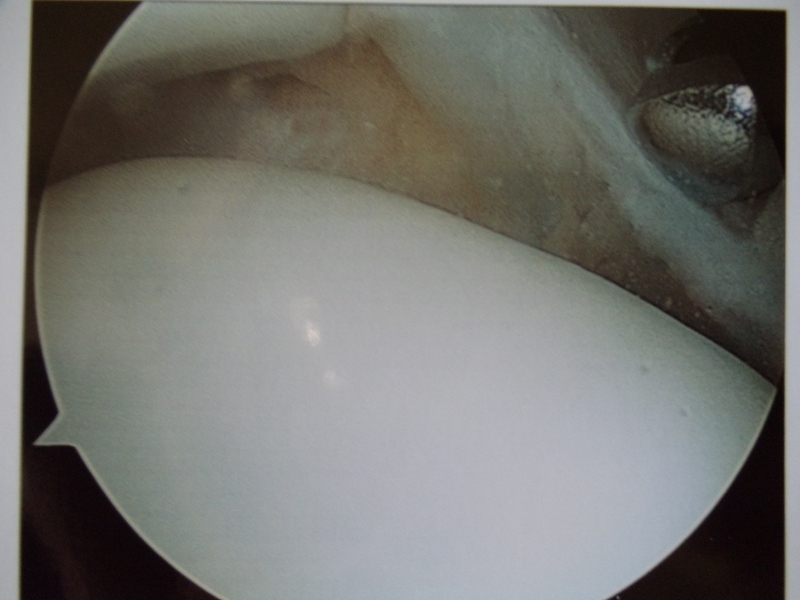 Impingement at the lateral aspect of the ankle joint with scar tissue on the intra-articular portion of the AITFL. 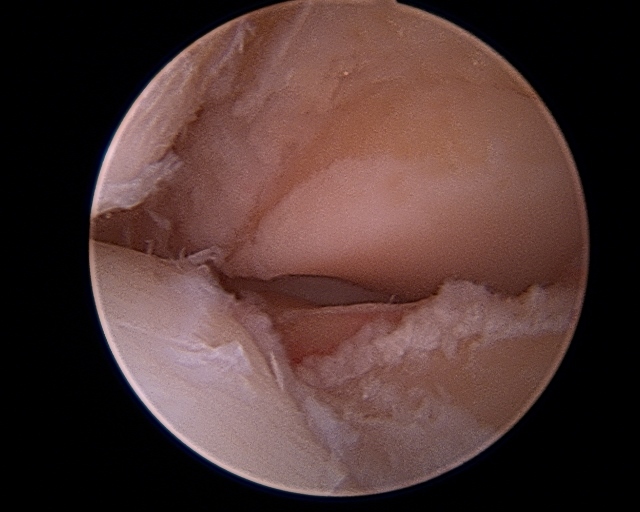 This causes irritation in the joint with range of motion. 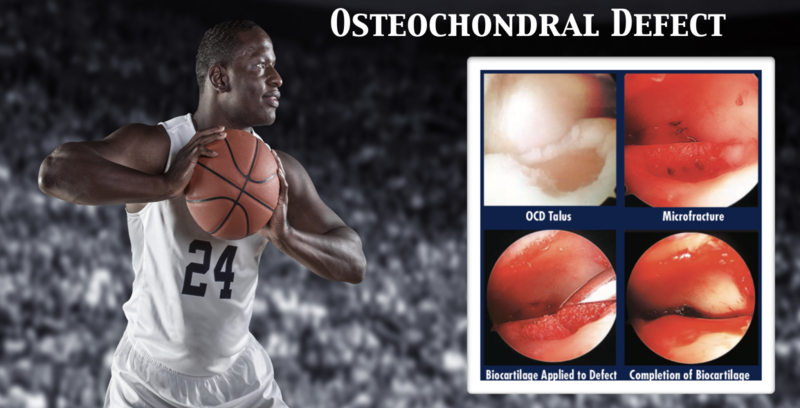 Please visit our Youtube page for more videos!